If you are planning a trip to Iceland, our 7 day Iceland itinerary will help you plan the perfect Iceland road trip. If you have 7 days in Iceland you have time to explore the capital city of Reykjavík, the west coast, the famous Golden Circle, and the south coast of the country. Our suggested Iceland itinerary includes cultural highlights, waterfalls, glaciers, national parks, Icelandic horses, fishing villages, black sand beaches, lava fields, and loads of scenic views. It covers some of the most famous and iconic places in Iceland as well as some lesser known spots. This itinerary is perfect any time of the year, including in winter where many places in Iceland become inaccessible or close for the winter. We visited all these places ourselves this last winter on a self-drive trip with Iceland Travel. Although you certainly can’t explore all the wonderful places Iceland has to offer, you can see a lot of the highlights of Iceland in 7 days. Our 1 week Iceland itinerary includes day-to-day driving details, sightseeing highlights, and lodging recommendations. In addition, we’ve also included loads of tips, advice, and recommendations to help you get the most out of your Iceland vacation! Should I visit Iceland in the winter? Should I drive or take a group tour in Iceland? I want to drive but should I book a self-drive trip or plan it all myself? What was our Iceland Travel self drive trip like? Can I drive the Ring Road in winter? Tips for to saving Money in Iceland in Winter? What if I have less than (or more than) 7 days in Iceland? Determining a Budget for Iceland? Tips for Booking Lodging in Iceland? Tips for seeing the Northern Lights in Iceland? Booking winter activities in Iceland? What should I pack for a trip to Iceland in winter? More tips for traveling in Iceland? Before we share our suggested 7 day Iceland itinerary, we wanted to share some tips and advice and answer some frequently asked questions about planning a trip to Iceland. These are focused on visiting Iceland in winter, but most apply to those traveling at any time of the year. We’ll go over the pros and cons of traveling to Iceland in the winter, how to decide the best way to get around Iceland, provide driving tips for Iceland, give some packing and budgeting advice, tell you how to maximize your chances to see the Northern Lights, and provide links to additional resources for planning your trip. There are many reasons why you may want to visit Iceland in the winter and many reasons why you may not want to visit Iceland in the winter. We’ll go through some of the main pros and cons of visiting Iceland in the winter to help you decide. Note that the “winter season” in Iceland is longer than in some other parts of the world, running from about mid-October to the end of April. Many of the highland roads are closed during this period. The pros of visiting in winter are that it is the best time to visit if you want to see the Northern Lights in Iceland, it is the least busy time of the year so less crowded, and you get the chance to see some wonderful wintry landscapes and experience winter weather. However, there are a number of cons to consider such as fewer daylight hours, many business have shorter opening hours or close completely during the winter months, potentially hazardous winter road conditions, less bird life for those interested in the seabirds, road closures are common and some parts of the country will be inaccessible or closed off to traffic, and, well, it’s cold. Note that if you are interested in visiting in winter but have some reservations you can do things to mitigate some of the cons. These include visiting in March versus December to get the most sunlight hours, planning each day so you maximize your daylight hours, knowing the best places to go in the winter that are not so dependent on weather and road closures, and packing properly so you can stay dry, warm, and comfortable during your trip. It really depends on a few things: your budget, your comfort with driving in Iceland, how much you want to plan ahead, and your travel style. Many people join group tours for the ease of it as they don’t have to worry about driving (especially in the winter), don’t have to book anything, and have tour guides for information. Group tours can also be great for those traveling alone who enjoy the company of others as they travel and they can also save you money (although this is not always the case). Some winter Iceland guided tours to check out are this Hidden Powers & Northern Lights Hunt tour, the Complete Winter Tour, and Highlights of the South Shore tour. For more Iceland tours, check out this excellent list of guided tours. Private tours are also possible although are generally very expensive. Those who enjoy more independent travel and feel comfortable driving can plan their own do-it-yourself independent trip and hire out a rental car, reserve their own lodging, book their own activities, and plan their own route. Another alternative is to book a self-drive trip in Iceland where all the bookings are made for you (e.g., rental car, hotels), but you still travel independently and drive yourself. 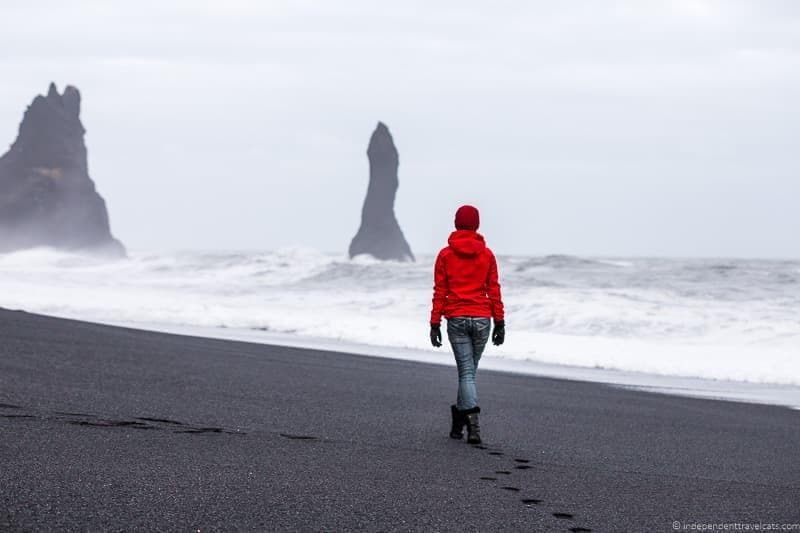 See our prior post with Iceland travel planning tips to help you decide what option might work best for you. No matter what option you choose, you can still use our 7 day Iceland itinerary to help you choose what places you want to visit. If you’ve decided you definitely want to drive yourself rather than taking a tour, you then need to decide whether you want to book everything yourself or book a self-drive trip with a company. The main advantage of doing it on your own is that you can have more flexibility in your schedule, you don’t need to book accommodation in advance, and it may or may not save you money. The disadvantage is that you have to do all the planning and booking yourself and don’t have the expert guidance of a travel company. The main advantages of booking a self-drive trip with a company is that someone else sorts out all your arrangements and makes your bookings for you, you have someone to call if anything goes wrong or you have questions. The main disadvantage of booking a self-drive trip is there is less flexibility if you already have a general route and hotels booked in advanced. In terms of which will save you money, it really depends as cobbling together your own itinerary allows you to look at hotel and rental car offers, special discounts, and consider peer-to-peer rentals through apartment websites like Airbnb. The best site to check first is probably Airbnb as it has so many listings. You can get up to $100 off your first AirBnB booking with this link. However, booking a self-drive itinerary trip can be less expensive if you plan to book similar places and do the same activities as often tour companies get discounts on car rentals, hotels, and activities that may translate into savings for you as well. So the two are both great options for the independent traveler and you should choose the one that best fits your travel style. We worked with Iceland Travel during most of our recent trip in Iceland. The Iceland-based company has been offering tours in Iceland since 1937 and offers a number of day tours, group bus tours, excursions, and self-drive trip itineraries (including campervan trips). We decided to do a self-drive trip as we had little time for in-depth planning and wanted the advice of experts on what to see and where the best places were to go during the winter. We were able to choose an itinerary, tell them the type of accommodation we wanted (we went for their comfort option; they range from budget to superior), type of car, optional activities we wanted to do, and other details. We specifically did their 8 day, 7 night Glorious Glaciers and Northern Lights lself-drive tour, and also added an extra 4 days where we traveled independently on our own. 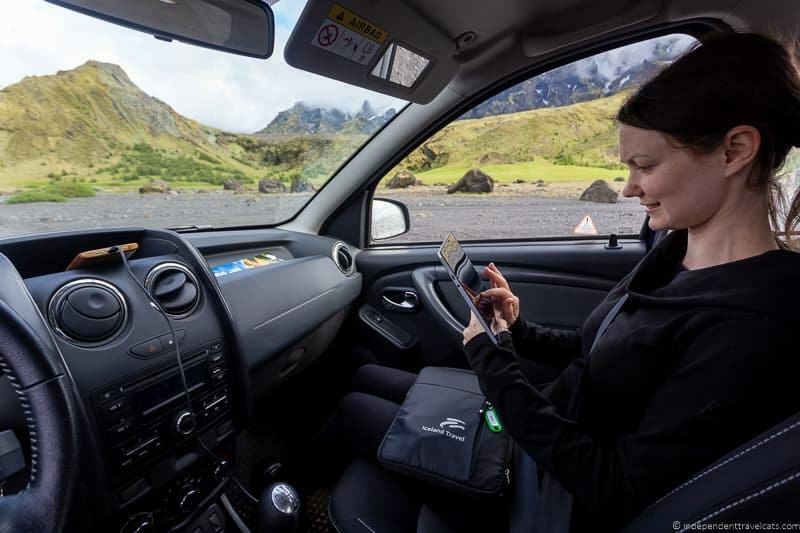 The self-drive trip prices generally include all your accommodations, breakfasts, rental car with CDW, car pick up and drop off, itinerary planning, and an Iceland Travel Companion digital tablet which has your itinerary, hotel details, safety advice, digital maps, and GPS. They also include an emergency contact in case you have any trouble outside normal business hours. Our itinerary presented in this post is a less detailed version of our self-drive tour with some modifications based on the rest of the time we spent in Iceland. For a more detailed review of our trip with Iceland Travel, check out the review of our Iceland road trip by Laurence. If you are looking for a self-drive trip that is similar, I’d look at both the Glacier Exploration and Auroras self-drive tour and the Winter Wonders & Delicious Detours trips. If you are used to driving on the right side of the road and have driven in winter conditions, you’ll likely have few problems following our suggested itinerary. You can read our Iceland winter driving guide for tips and advice on everything from the road conditions to expect, driving laws, how to prepare for the winter weather, and what to do in the case of an emergency. We found driving fairly easy in Iceland, although you do need to be very careful during storms and bad weather conditions which can happen fairly suddenly. We found road signs well posted along the main routes although we also used a GPS, our phone, and a detailed paper road map for directions. We’d recommend having a GPS with you as well as a paper map (or downloaded offline map) as you’ll likely lose satellite connections/phone service in some areas along the way. In terms of rental cars, you certainly don’t need a “superjeep” or large SUV, but I would recommend something with 4-wheel drive and winter tires. If you are planning to stay on main roads, you don’t need a 4WD Jeep either. But a 4WD of any kind is good if you slide off the road a bit and need to get back on. If you get your tires stuck in a ditch with a 2WD, you’ll likely need to call a tow truck whereas you may be able to just drive out with 4WD. We had a rental car from Hertz Iceland that was a 4-wheel drive passenger car with a GPS and winter studded tires. We would highly recommend the same as although the main roads on this itinerary are kept cleared, you are still likely to encounter some snow or ice on the road during your trip and it always good to be prepared. We drove through a short snow storm at the end of our trip and were happy to have a 4WD car with studded tires. To find the best deal on a rental car in Iceland, we recommend comparing rental car prices on this Iceland rental vehicle aggregator site which rents everything from 2WD passenger cars to 7 person vans. You can also check on other rental car comparison sites like Priceline here. When looking up locations, the English spellings (or any language spellings) of Icelandic words often vary. This can be particularly trying when trying to type places into a GPS or Google Maps but just be patient and you should be able to find it. Some quick tips is that generally the following is true: æ = ae, ð = d, and Þ = th. Also note that like in many countries, there are sometimes more than one town or attraction with the same (or similar) names so do double-check that your GPS is sending you the right direction before setting out. A few general Iceland driving rules are that drivers drive on the right side of the road, seatbelts are required at all times, it is illegal to drive off-road in Iceland, it is illegal to use a cell phone while driving (unless hands-free), it is illegal to drive under the influence of alcohol (very low limit), and vehicle headlights should be on at all times when driving (day and night). See our Iceland driving tips post for more. Watch out for animals on the road, especially sheep. Be careful when pulling off the road and be sure to park in designated parking areas to protect the environment. While it might be tempting to just stop on the road to look at something or take a photo, it is not only illegal but can cause an accident. Throughout the winter, the “highland roads” or “mountain roads” are all closed and you’ll see signs marked Impassable posted. If you choose to go pass these signs, note that it is illegal and you could receive fines if caught, it is likely against your rental car agreement, and if you get stuck you’ll likely be waiting awhile to get towed/rescued and will likely be subject to heavy expenses and fines. 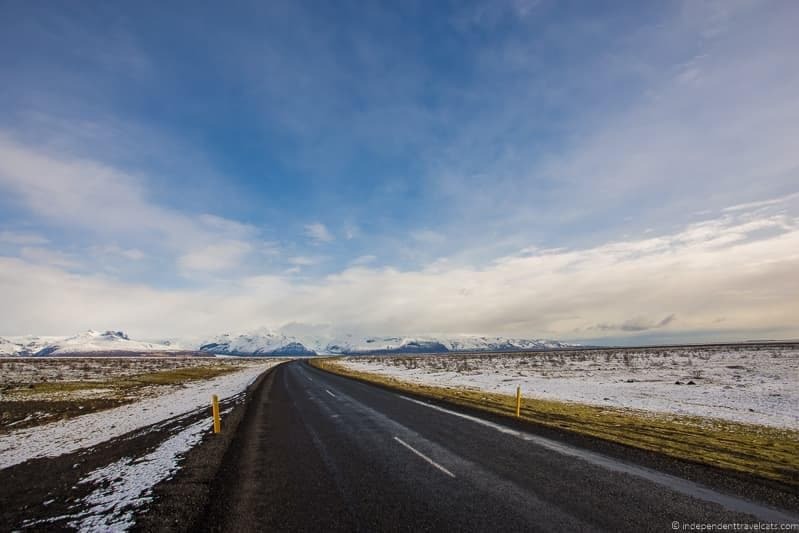 For more Iceland driving rules and tips and to stay up to date on road conditions, check out the Road Conditions website and for all kinds of safety and travel information in Iceland check out the Safe Travel website. I’d bookmark both of these websites if you plan to drive in Iceland. Yes, but it is not recommended. Iceland’s Ring Road is a nickname for Route 1 which loops around the island connecting the most populated towns together (very few people live in the country’s interior). It circles the outer part of the island at a length of 1,332 kilometers (828 miles). Whereas most of the road is paved and two lanes, there are sections, especially in the east and north that are unpaved gravel and there are blind curves and one lane passes along the route. In the winter months, this road can often be dangerous and hazardous. Even if you start the trip with good weather conditions, winter storms and icy conditions can occur very quickly and leave you stranded. We did a trip with Iceland Travel, who have been doing trips in Iceland since 1937, and they do not sell Ring Road self-drive trips in the winter as they don’t feel it is safe enough for visitors to do it on their own. Not only can sections of the drive be hazardous, but also many of the attractions are often not accessible due to winter closures of roads and many businesses shut down or have limited hours during the winter. Also road closures can play havoc with your plans and actually as I write this (in May! ), a storm has closed a section of the Ring Road on the east side of the island because of a storm. If you are going to do it anyway, be sure to have a 4WD vehicle with studded tires, and carry emergency supplies. But if you really want to drive the full Ring Road and see all of its attractions, I’d visit between the late Spring to early Autumn. The good news is that you can safely drive the better maintained and traveled sections of the Ring Road in the winter (west and south) where you can see many of the road’s most popular highlights and they are included on our itinerary. 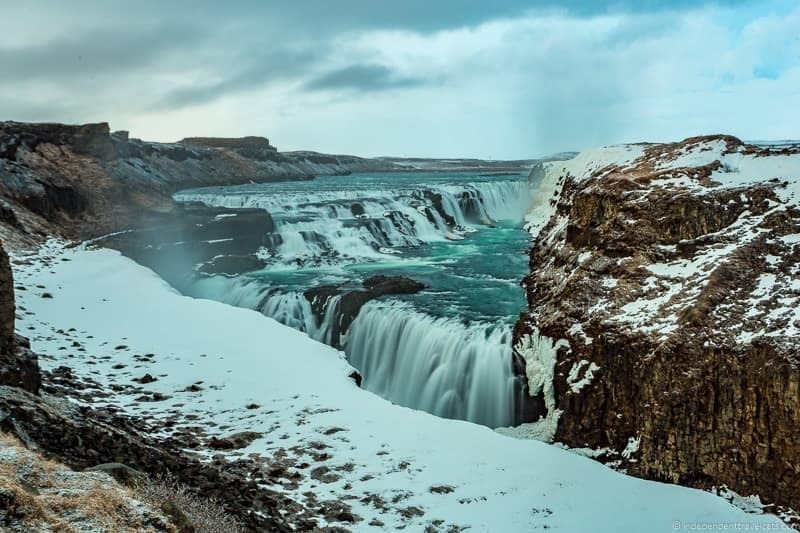 Another alternative is to book a group tour such as the Iceland Complete Winter tour which does a guided tour of the Ring Road highlights tailored for winter. If you are driving outside of winter, then we can certainly recommend the Ring Road if you have at least 7 days and you can check out our suggested Ring Road itinerary. Iceland is an expensive country and the prices of fuel, alcohol, food, and clothing are some of the highest in the world. One good thing about winter is that the prices of some things, such as lodging, are often a bit cheaper in the winter compared to the busier summer months. But there are still lots of ways to save money and stay within your budget. These include finding cheap flights, using fuel discount cards, drinking the free tap water, cooking your own meals, carpooling, using local coupons, and looking for free attractions. Check out our guide to traveling to Iceland on a budget for 21 budget tips that cover ways to save money on everything from flights to food to attractions in Iceland. We present a suggested 7 day Iceland itinerary but even if you have more or less than 7 days in Iceland, it is easy to modify. For those with 5 days for example, you might eliminate Day 2 and Day 3 and head directly to the Golden Circle on Day 2 and then do the rest of the itinerary. If you have only a few days, I’d prioritize a few places you really want to visit and head there. We also have a guide to visiting Iceland on a three day stopover for those of you looking to visit for a shorter time. For those with more than 7 days in Iceland, I would just slow everything down and add days to the areas that sound most interesting to you. With more days, you can avoid having a lot of one-night stands (changing hotels every night), head out on longer hikes, book more activities, visit more museums, and get to see more of the local sites. It is easy to modify the suggested itinerary and if you have questions or want recommendations, just leave us a comment and we’ll tell you what we think! Iceland is expensive. Cheap flights are available from many locations (particularly western Europe and North America) but travel costs within the country are high. Whereas reasonably priced lodging can be found throughout the country, food, drinks, entry fees, fuel, and guided activities are expensive compared to most other destinations. It is expensive not only for tourists, but also for the people living there. For example most people think the UK is an expensive country but the cost of living in Iceland is 68.74% higher on average than living in the UK using May 2017 prices. Also visitors should note that Iceland is not part of the European Union and does not use the Euro, but they use the króna (normally abbreviated ISK) for currency. It is easy to withdraw króna or exchange most currencies at the airport or major banks in Reykjavík. You can save money during your trip by grocery shopping (although note even grocery prices are quite high), eating at fuel stations, diners, and fast food places, going to regular public baths rather than tourist-oriented ones, staying in hostels, guesthouses, and farm stays versus hotels, limiting the number of activities you book, and limiting alcohol consumption. Just note that currently a loaf of bread will cost you about USD $4 and a Subway meal is about USD $15 so even groceries and fast food aren’t exactly cheap. Activities such as horseback riding, snowmobiling, and glacier tours are often over USD $100 per person and often in the USD $200 to $400 range depending on what is included. A 4-hour helicopter tour over Iceland can cost you almost USD $2,000 per person. Of course you don’t want to spend your whole trip eating gas station food and avoiding doing any fun adventure activities, so even if you are on a tight budget, it is best to plan for at least a couple of splurges to make the most of your time. I would check the current prices in Iceland before you go so you have a good idea on how to budget and what to expect as many people we met on our trip were shocked by the prices. Read our post on traveling in Iceland on a budget for lots of advice on setting a budget and budget tips. There are less chances of accommodation being full in winter, but often there is limited lodging options the further you get away from Reykjavik, so booking in advance is advised. Also if you are looking for a certain type of property (e.g., hotel with a restaurant) or have a certain budget it is definitely best to book ahead. 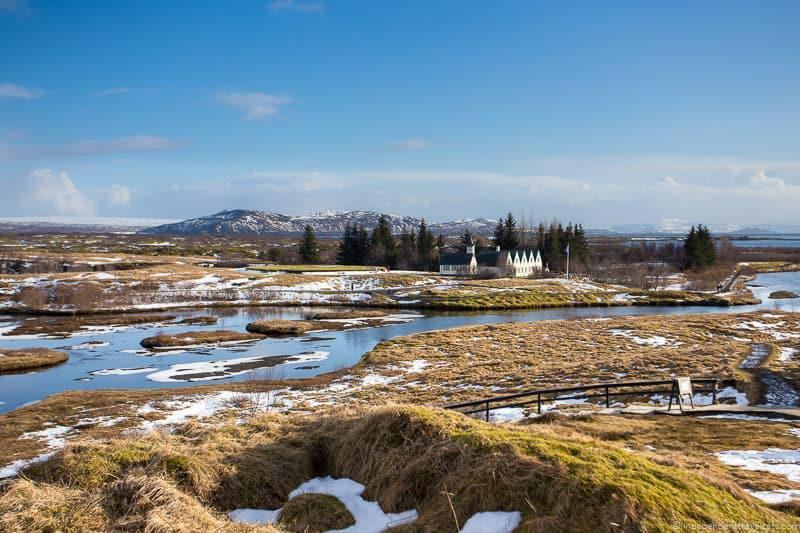 Also note that although things are changing, there are few luxury properties outside of the Reykjavik and the Blue Lagoon areas so most places fall into the mid-range to basic category with most lodging options in other parts of the country being comfortable but basic hotels, guesthouses, B&Bs, farm stays, and apartments. We’ve provided lodging suggestions throughout the itinerary to give you some places to start if you are booking your own accommodation. Winter is the best time to see the Northern Lights in Iceland. In fact you have almost no chance to see them in the Summer and much lower chances in the Autumn and Spring. In order to see the Northern Lights you need a combination of several things: high levels of solar activity, darkness (you can only see them at night), clear or partly clear skies, and an absence of light pollution. Some of these elements you can’t control (e.g., solar activity, cloud cover) and in fact even though we were in Iceland for 12 days, we never saw the Northern Lights in Iceland even though we tried as they were just not active. But you can control where you are and you can head to sparsely populated areas where there is little light pollution and you can also check the weather forecast for areas with clear skies. Check the aurora forecasts for the best days and times to see them by using online websites, apps, or asking at your hotel (hotel desk staff often post the daily aurora forecasts and many hotels offer a wake-up service if there is activity). We used the Icelandic Meteorological Office Aurora Forecast to monitor activity during our trip as it is probably the best one to use in Iceland, and also got on the list at most of our hotels for the aurora wake-up service. Often if the activity is low you won’t be able to see them with your naked eye, but you may be able to detect green glows using your camera. If activity is strong, you’ll be able to see them with your naked eye and if they are really strong you may be able to see them even if you are in an area with some light population as our friend actually saw them from his hotel in Reykjavik. Most tour companies in Iceland run evening Northern Lights tours you can book (such as this one and this one) and they’ll pick you up from your hotel and take you to spots where you have the best chance to see them. Northern Lights tours often include other activities as well (e.g., visits to other attractions, meals, snowmobiling, campfires, hot tubbing) since seeing the Northern Lights is far from guaranteed. It can be tricky to get good photos of the Northern Lights, and you can check out our guide to how to photograph the Northern Lights for tips and advice. There are a number of fun things to do in Iceland in winter such as skiing, snowshoeing, dog sledding, snowmobiling, ice skating, and participating in holiday festivals. The more adventurous may want to try heli-skiing or diving. Many activities require booking a guided experience since they are not safe to do on one’s own. These include exploring ice caves, ice climbing, whale watching, dog sledding, and snowmobiling tours. If interested in some of these winter experiences, you can see our post that gives a fairly comprehensive overview of the available winter activities in Iceland, and how you can do them on your own (if possible) and how you can book a guided experience. Iceland is a country where the weather can change very quickly no matter what time of year you visit, so packing layers is always a smart option. Essentially you need to pack as you would for any cold weather destination and also factor in any activities you may be doing that may require special items (e.g., hiking, horseback riding, snowmobiling, diving, fishing, visiting public pools). Check the weather forecast before you go and be sure to pack all the needed essentials as trying to buy a coat, camera accessories, or even shower shoes in Iceland can be very expensive and options are limited. In the winter, we’d suggest packing and wearing thermal base layers, then warm mid-layers like fleeces, followed by waterproof and windproof outer layers. Be prepared for snow, rain, mist from waterfalls, and heavy winds so be sure that you have a warm coat with you that you can wear in cold temperatures and is made for snow and rain (or alternatively pack a second jacket that is rain and wind proof). You’re also going to want good waterproof hiking boots if you plan to hike, a pair of winter boots if you plan to walk around in the snow, a quality pair of gloves, a warm hat, and sun protection. If you’re visiting any of the thermal springs or pools, you’ll definitely want to pack your swimsuit and may also want to bring a towel (provided at Blue Lagoon but not at public pools), a pair of sandals or shower shoes, and a waterproof case or bag for your phone and/or valuables. If you are planning to do a specific outdoor activity (e.g., skiing, diving, hiking), then you may want to bring along some additional things like prescription goggles, ski pants, or a waterproof hiking pack. For serious hikers, I’d also pack waterproof pants, a travel first aid kit, and waterproof covers for your packs and gear. Other than that you don’t need to pack anything particularly special for a trip to Iceland. Check out our full Iceland packing list for winter for more packing suggestions and tips, as well as a printable packing list. First, I’d begin with our other post on tips for traveling to Iceland that should help you get started on planning your Iceland trip no matter when or how you plan to travel. 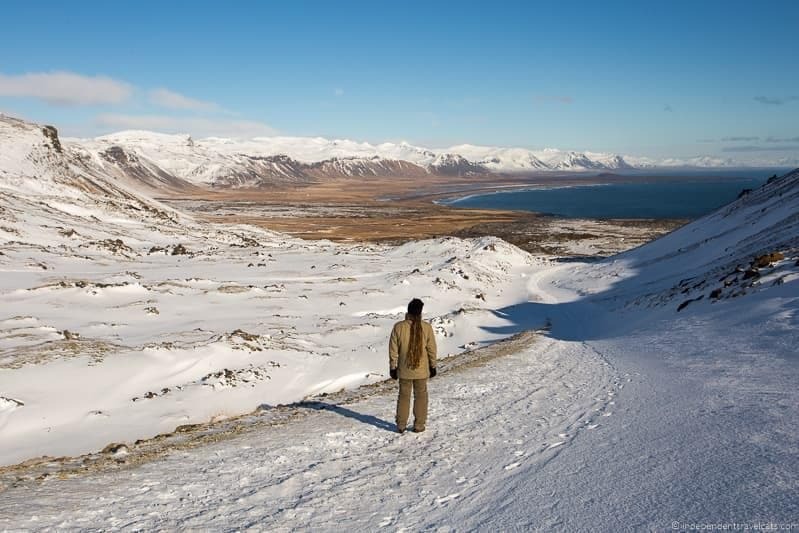 For winter travel, also check out our guide to popular winter activities in Iceland. If you are looking for great photo locations, check out Laurence’s guide to photography locations in Iceland (all are possible in the winter!). For budget tips, check out our Iceland budget tips. Game of Thrones lovers, will want to check out our list of Games of Thrones filming locations. Also you can check out the official Reykjavík tourism and Iceland tourism websites for further information to help you plan your trip to Iceland. If you have questions, we have a good knowledge of Iceland now and also have contacts in the country, so are happy to try to answer any questions. Just ask them in the Comments section at the very end of the article. Here’s a summary of our 7 Day Iceland itinerary before we go into the day by day breakdown. Day 2 – Explore western Iceland, enjoy coastal views, see your first waterfalls, and consider a glacier or cave tour. This 7 day Iceland itinerary is a modified version of the self-drive trip we did with Iceland Travel and you can read more about it above. Also, although the itinerary and suggestions are all geared for those traveling in the winter, this itinerary works all year round and includes the most popular tourist attractions in the country. What do Do? 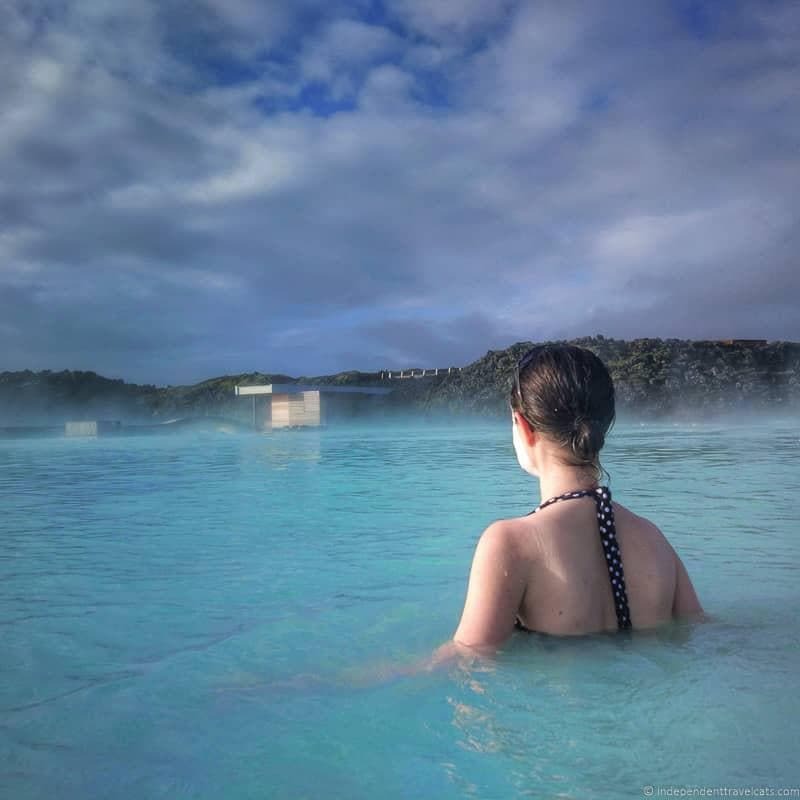 : We’d recommend that you make the famous Blue Lagoon your first stop to kick off your Iceland trip as it is located near the Keflavik airport. 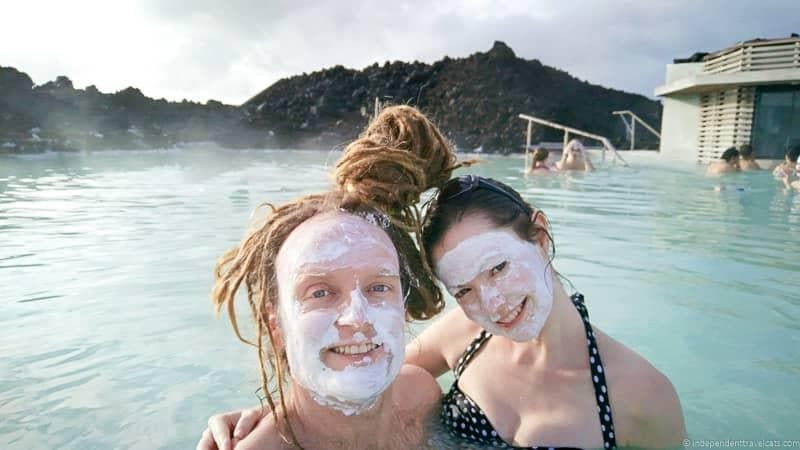 It is easy to enjoy the milky blue waters of the Blue Lagoon as you wade about, enjoy a cold drinks, and cover your face with the algae and silica mud masks. 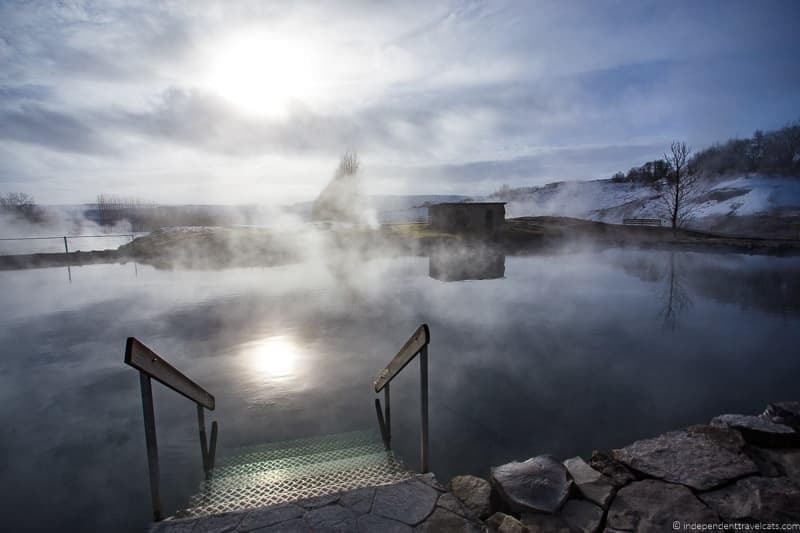 You can visit the geothermal pool at any time of the year, and winter is a special time to visit as you have the cool winter air, snow topped lava landscape, and the steam rising from the hot blue waters. Icelandic people love their pools and many visit their local pool daily although you won’t see many here as it is expensive and primarily a tourist destination. But it is worth a one-time stop as it really is a beautiful place. The Blue Lagoon is one of the most visited attractions in Iceland so expect crowds, especially later in the day. Pre-book your ticket online (you do need to book in advance) and you’ll receive a timed entry to the spa. Plan to spend at least 2 hours here. Alternatively, you can also visit the Blue Lagoon on Day 7 as your last stop before you head to the airport as it fits easily into that day as well. Reykjavík is Iceland’s capital city and the largest and most vibrant city in Iceland. Here you’ll find the best art, culture, restaurants, city parks, theaters, architecture, festivals, and museums that the country has to offer. Iceland is the most sparsely populated country in Europe (only about 330,000 inhabitants) and the majority live in or within an hour’s drive of Reykjavík. The country may not have the world-famous attractions of Italy or England, but it does have some great smaller museums and attractions that are often overlooked by visitors. With just one day you might consider doing a walk along the Old Harbor area and seafront and choosing a couple of attractions to visit such as the National Museum of Iceland, Hallgrímskirkja Church, The Settlement Exhibition, Reykjavik Family Park, Saga Museum, Árbaer Open Air Museum, or one of the city’s many art museums (combined admission entry to Hafnarhús, Kjarvalsstaðir and Ásmundarsafn is good for 24 hours). For shopping in Reykjavík, you’ll likely want to head to the city centre where you’ll find a number of shops, restaurants, and cafés clustered together. Laugavegur is the main shopping street here and considered the best place to shop for the latest clothing, homeware, and accessories. Where to Stay? We’d recommend spending your first night in Reykjavík although if you are not interested in the capital’s attractions, you can also stay near the Blue Lagoon or airport. There are loads of options of places to stay in Reykjavík from hostels to apartments to luxury hotels. I would suggest basing your decision on what you want to see in the city and stay nearby although it is pretty easy to get around the city. In Reykjavík we stayed at the Grand Hotel, Guesthouse Galtafell, and Reykjavik Natura Icelandair Hotel. We would recommend making reservations once you know your dates as many places do book out in advance. Summary: Explore part of western Iceland, enjoy coastal views, visit a couple of towns, see your first waterfalls, and consider a glacier or cave tour. What do Do? : Head north from Reykjavik towards Borgarnes. You can take the undersea tunnel at Hvalfjordur (small fee, can save about 30 minutes) or you can follow along 47, a coastal road. You can then stop in Borgarnes and explore this former fishing town that sits on the shores of a scenic fjord. Borgarnes is famous for being near the spot of Borg where the Viking poet and warrior Egill Skallagrimsson lived in the 10th century. In the town, there are a few restaurants and you can also visit the award-winning Icelandic Settlement Centre (learn about the settlement of Iceland and Egil’s saga) and/or the Borgarnes Museum. Next head onto road no 50 and then make a short stop at Deildartunguhver hot springs (near junction of 50 and 518), which are the most powerful hot springs in Europe with water flowing at about 180 liters/second with water temperatures around 206°F/97°C! You can also often buy fresh produce grown in the greenhouses heated by the geothermal energy here. There is also a new geothermal spa here next to Deildartunguhver hot springs Krauma Baths which has 6 baths, a steam room, and relaxation room. They also have a really good restaurant that serves both lunch and dinner. We can recommend the spa and/or restaurant for anyone needing a break this afternoon! Then head on to tiny Reykholt which is known for having been the home of one of Iceland’s most famous writers and scholars Snorri Sturluson. Visit the Snorrastofa, the Visitor Center and Exhibition Center, if you want to learn more about the work of Snorri Sturluson as well as the culture and history of the area. Next get ready for your first waterfalls of the trip with at stop at Hraunfossar (a series of waterfalls that flow from underneath a lava field into the Hvítá river) and Barnafoss waterfall (just a short walk upstream from Hraunfossar). Heading further on to Húsafell, this is where many of the tours to Langökull Glacier (Iceland’s second largest glacier) depart in the winter. If you want to visit a cave, you can continue on to find Vidgelmir Cave, Iceland’s largest lava cave that can be visited on a guided tour. You may also want to book an activity in the area for your day here (or add a day if you want to spend more time doing glacier or cave activities). There are a load of activity options and some to consider include the Into the Glacier tour where you take a 8-wheel vehicle tour onto Langjökulll Glacier and into an enormous ice tunnel, snowmobile & ice tunnel tour of Langjökull Glacier, or a tour of Iceland’s largest cave, Vidgelmir Cave. Or maybe just an afternoon relaxing at Krauma Baths or an evening Northern Lights tour! We’ve done the Into the Glacier tour into the Langjökull glacier ice tunnel from Húsafell and the Vidgelmir Cave tour, and enjoyed both. Be sure to book any activities at least a few days in advance to guarantee a spot and note that many are weather dependent and may be cancelled in bad weather. Where to Stay? : We’d recommend staying in or around Borgarnes or Húsafell depending on what you plan to do. I’d personally recommend returning to Borgarnes as there are more lodging options and it is closer to the Day 3 route. You can also overnight at Borgarnes for 2 nights as it is also a convenient place to base for Day 3. However, if you have an evening tour booked around Húsafell, then it may be easier to spend the night there. In Borgarnes, you may want to check out Hotel Hamar (where we stayed), Kria Guesthouse, Borgarnes Bed & Breakfast, or Hotel Rjukandi. Near Húsafell, you might consider the well-rated Hotel Husafell. What do Do? 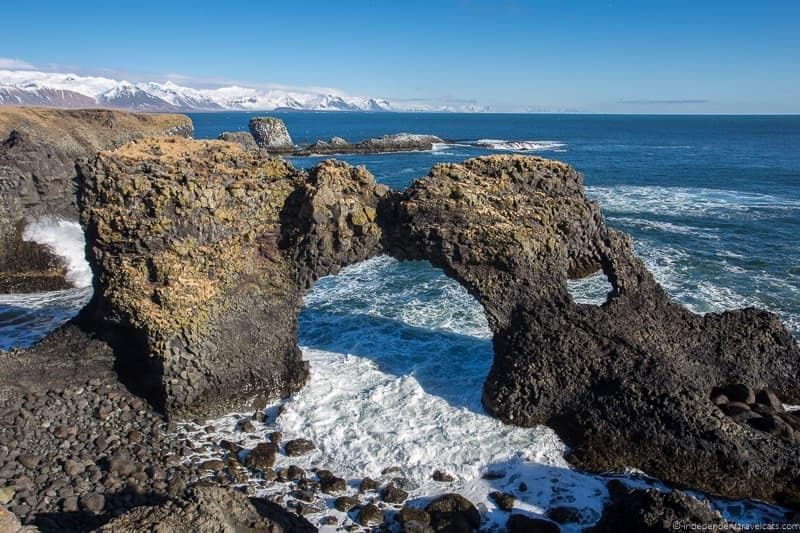 : We recommend that you spend a full day exploring the Snæfellsnes Peninsula (Snaefellsnes Peninsula) as it is a beautiful area of Iceland with lots of scenic attractions. There is a lot you can do here and you should pick and choose what sounds best to you given the time you have to explore. The itinerary route for this day is also totally reversible. You may want to start with a visit to Stykkishólmur, the largest town in the area with a naturally sheltered boat harbor and a good place to get visitor information (and any supplies/groceries/fuel you need). There are a few attractions here you may want to visit such as The Norwegian House (Norska Húsið), the Library of Water (Vatnasafn), and the Volcano Museum. Heading south, you may want to make the quick climb of Helgafell (Holy Mountain) which has some nice views or visit the Bjarnarhöfn Shark Museum to learn about shark fishing and have a taste of fermented shark meat (hákarl). You’ll drive through the Berserkjahraun lava field (you might want to stop off and read the story here) and there is also a trail you can follow. Around Grundarfjordur, you’ll see both Mt. Kirkjufell and the Kirkjufellsfoss Waterfall (one of the most known waterfalls on the peninsula although you’ll likely notice several smaller ones as you drive around). Along the coast you can stop at some of the small fishing villages (many of the villages are more focused on tourism than fishing these days) such as Rif, Ólafsvík, and Hellissandur. Sightseeing boat tours, whale watching tours, and fishing trips are also possible along the coast on the peninsula and leave from several towns including Stykkishólmur, Grundarfjördur, and Ólafsvík. The most known attraction on the peninsula is the glacier-topped mountain Snæfellsjökull as it was featured in Jules Verne’s Journey to the Center of the Earth as an entry point to get to the center of the earth. The Snæfellsjökull National Park Visitors’ Center is in Hellissandur, and a good place to stop to learn more about the mountain and glacier and plan what you want to do there. In the winter, you often can’t access the glacier by car (it was not possible when we visited), but you can book a tour or follow the road up to the glacier edge on foot. We walked up part of Route 570 on foot to Songhellir (the “Singing Cave”) and got a view of the glacier from here. In the winter, it can be difficult to distinguish the glacier from the snow while in warmer temperatures it is much more striking and easier to visit. Consider booking a snowmobile, guided hike, or snow scooter tour if you want to go onto the glacier, and/or a Vatnshellir Cave tour (currently only operated by Summit Adventure Guides) if you want to visit the inside of the major cave here. After leaving Snæfellsjökull National Park, you can explore the other side of the peninsula and visit a few more scenic fishing villages such as Hellnar and Arnarstapi. Both have some great coastal views and there is a great coastal path that runs between the two if you have time for a hike. 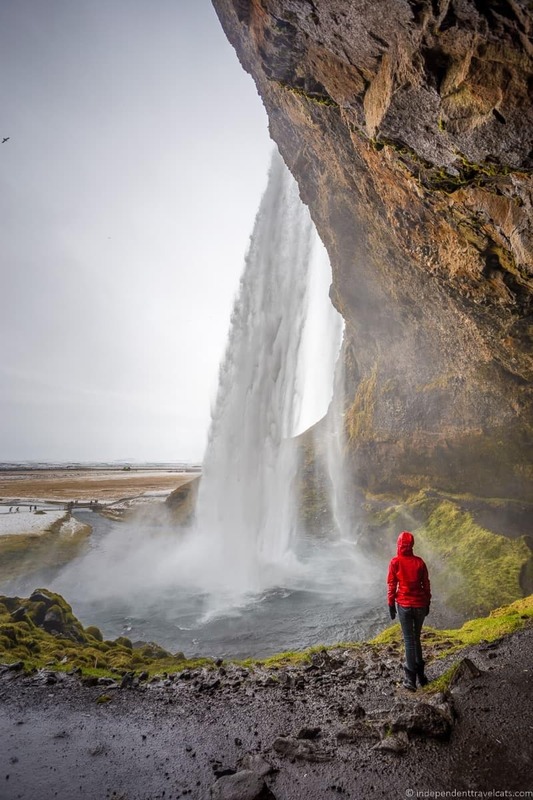 You can stop and see the Bjarnarfoss waterfall as you get close to Búðir (Budhir) or make a short detour to see the Búðakirkja (a 20th century reconstruction of an 18th century village church) or hike through the surrounding lava fields here. As you leave the Snæfellsnes Peninsula, you might want to make a short pitstop to fill your waterbottle at Olkelda mineral spring (a short detour off 54) where the mineral-rich water is supposed to have health benefits (tastes terrible but not as bad as fermented shark!). Where to Stay? : We’d recommend spending the night in Borgarnes as it is a good base and you can skip changing hotels if you were already staying there on Day 2. However, there is also lodging on the peninsula itself and if you are wanting to do things at night, it is best to probably overnight there. Stykkishólmur is the main tourist center and largest town with the most options but you’ll also find limited lodging elsewhere. On the Snæfellsnes Peninsula, you may want to consider Fosshotel Stykkishólmur, Our Home Apartments (Stykkishólmur), Hotel Egilsen (Stykkishólmur), Old Post Office Guest House (in Grundarfjordur), Fosshotel Hellnar (in Hellnar), Arnarstapi Guesthouse (near Arnarstapi), Guesthouse Hof (near Budir, where we stayed), and Hotel Budir (in Budir). What do Do? 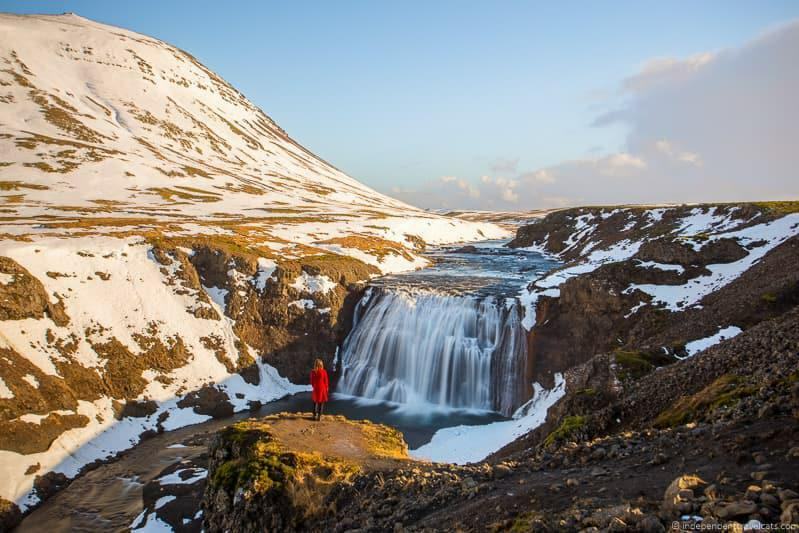 : Today you’ll get up early to leave Borgarnes (or the Snæfellsnes Peninsula) and head back south towards Reykjavik to begin your exploration of the famous Golden Circle. 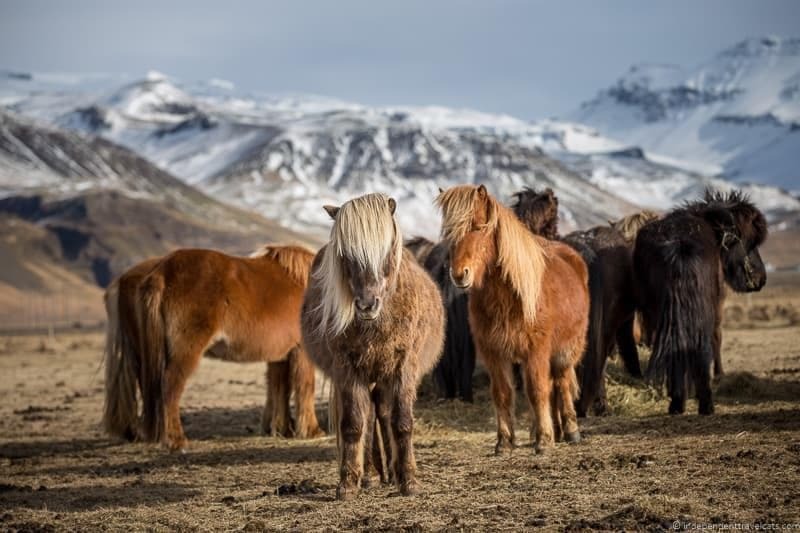 First though, if you love Icelandic horses, you may first want to make a stop at a horse farm like Laxnes Horse Farm near Mosfellsbær to learn about their Icelandic horses and do a 1.5 to 2 hours horse riding activity. These need to be booked in advance. The first main stop today will be in Thingvellir (Þingvellir) National Park which is one of the most famous historic, geological, and religious spots in Iceland because it was the place of the first church, the site of the first parliament in Europe (the Alþingi general assembly), and has a number of notable geological features. 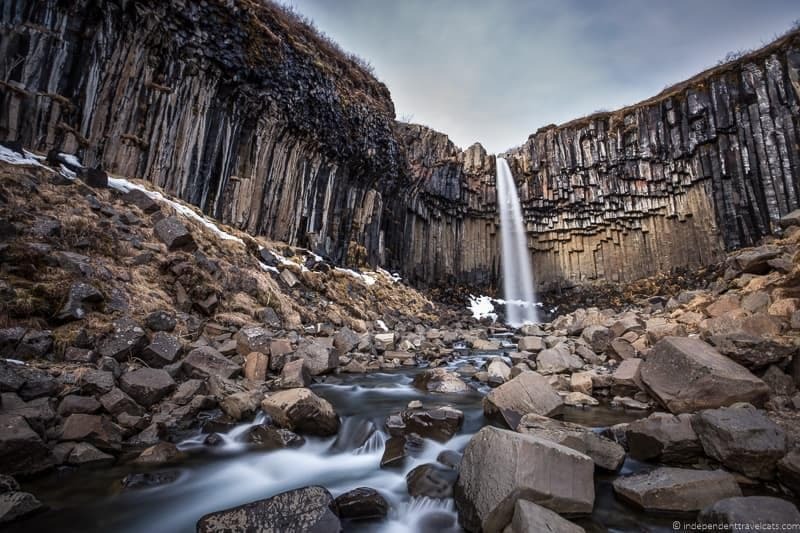 In addition to waterfalls like Öxarárfoss, you can find interesting stone formations, including being able to see parts of both the North American and Eurasian continental plates. If you have certified diving experience, you can even go diving here in two submerged rifts in the National Park, Silfra and Davíðsgjá! Snorkeling and diving can also be done year-round at Silfra. You’ll want to book with a company in advance, and we recommend this snorkeling tour for those wanting to snorkel Silfra. If you want to dive (you need to have a dry suit certificate & suitable experience), check out these diving tours. Next you can head towards Lyngdalsheiði, a geothermal area and soon you’ll pass the Fontana Geothermal Baths (a less expensive alternative to the Blue Lagoon) in Laugarvatn. 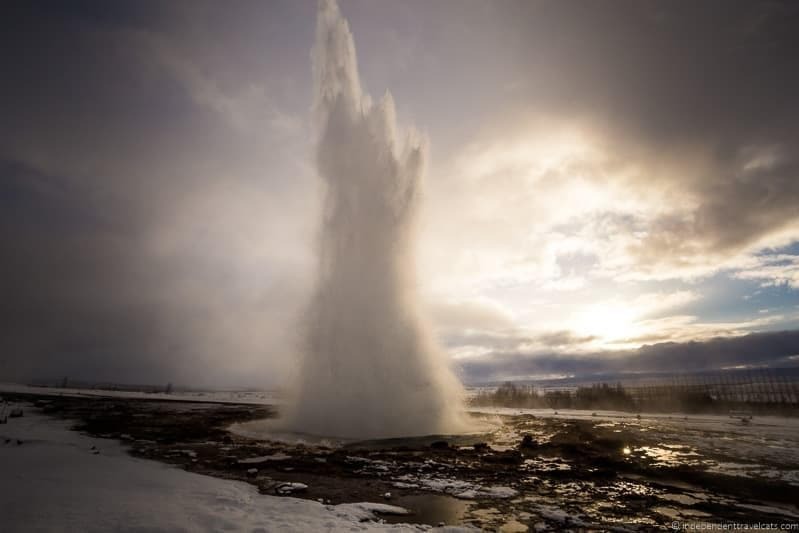 Then you’ll head to Geysir which gave its name to the international word geyser. The most popular geyser here is Stokkur (the Churn) which erupts about every 10 minutes. Then continue on to see the beautiful Gullfoss waterfall, the two-tiered waterfall is one of the most well-known and beautiful in Iceland. It is quite large and it is difficult to see it all from one viewpoint! If you are looking for a winter activity in this area, you can also join a tour to go on a snowmobile tour or glacier walk such as this tour which takes you snowmobiling on Langjökull glacier. Then if you haven’t run out of daylight you can head on through to Hvammsvegur (there is another popular geothermal spa here called the Secret Lagoon!). Where to Stay? 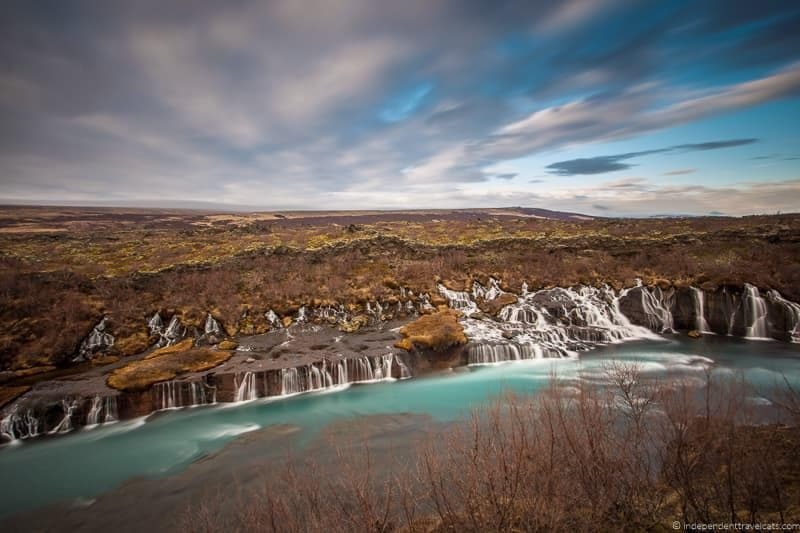 : We’d recommend spending the night in either Flúðir or drive on further and stay around Selfoss which will put you closer to your first stop tomorrow. Around Selfoss, you may want to check out Hotel Selfoss, Hotel Hlid, Selfoss Hostel, and Gesthus. Around Flúðir, you can check out Icelandair Hotel Fludir (where we stayed), Guesthouse Dalbaer, Viking Villa Fludir, and Guesthouse Fludir. What do Do? : Today you’ll head east along Iceland’s southern coast, passing through farmland and lava fields, staying mostly on Route 1. Note that there is a lot to cover today but don’t worry if you can’t see it all, most of these places can also been seen on Day 7 on your way back to Reykjavik. Selfoss is a good place to get supplies and fuel before heading east towards Hvolsvöllur where you may want to visit the Saga Centre where you can learn about the Njal’s Saga. If the skies are clear you’ll get views of Mt Hekla, Iceland’s most famous and active volcano (last big eruption in 2000), as well as the glacier topped volcano Eyjafjallajökull (well-known for its 2010 eruption) and possibly even the Westman Islands which have amazing birdlife in the warmer months. 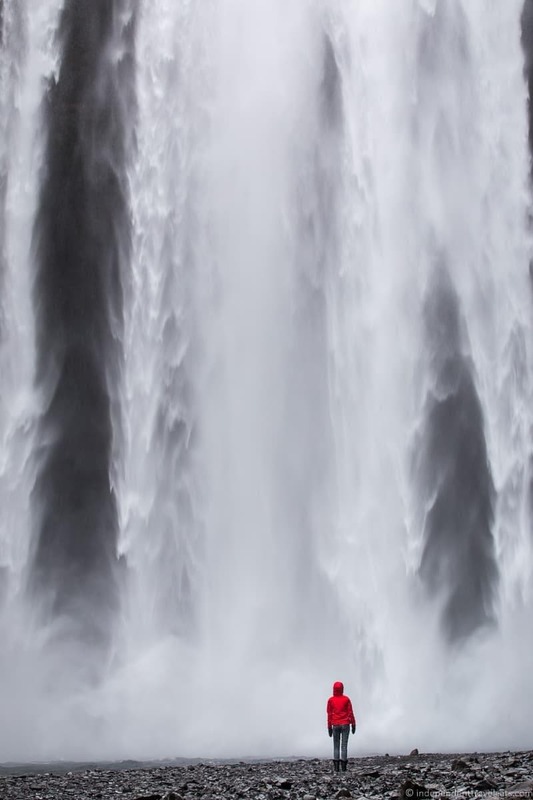 You’ll want to make a stop at the Seljalandsfoss, a pretty waterfall you can actually walk behind if the path is open (although be careful as it is wet and steep in places). Note that you need to pay to park at this waterfall (there are several machines in the parking area) and display your paid parking receipt on your car before heading to the waterfall. Also nearby, just a little further up the road (you can easily walk here along a walking path from Seljalandsfoss), is the waterfall Gljúfrabúi. Less picturesque than Seljalandsfoss, it is often called the Hidden Waterfall as it is partially obscured by a giant rock. You can get inside the gorge by wading up the stream or see it from a steep upper path, but be careful as both can be icy and the path can be wet and slippery year round. I’d only get up close here if you have waterproof boots and don’t mind getting wet. In Skógar, you you can visit another beautiful waterfall Skógafoss as well as the local folk museum Skógasafn. 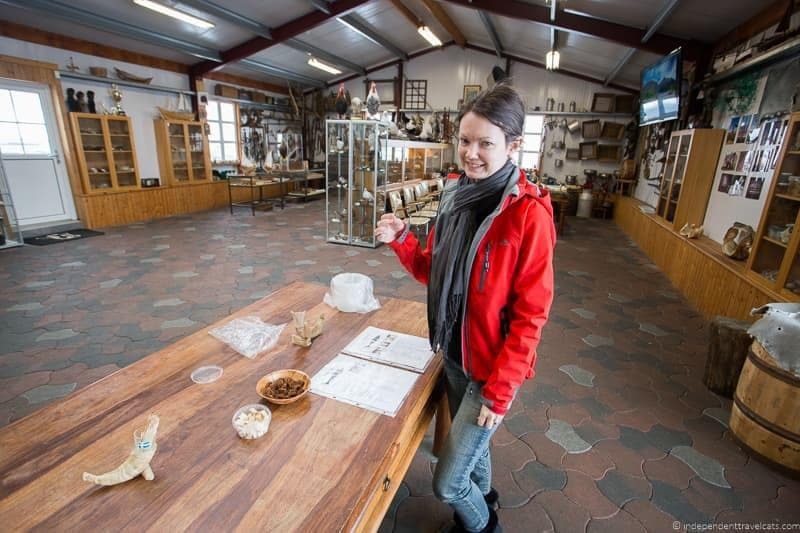 The open-air museum complex is one of Iceland top cultural museums with over 15,000 artifacts and 6 historical buildings. 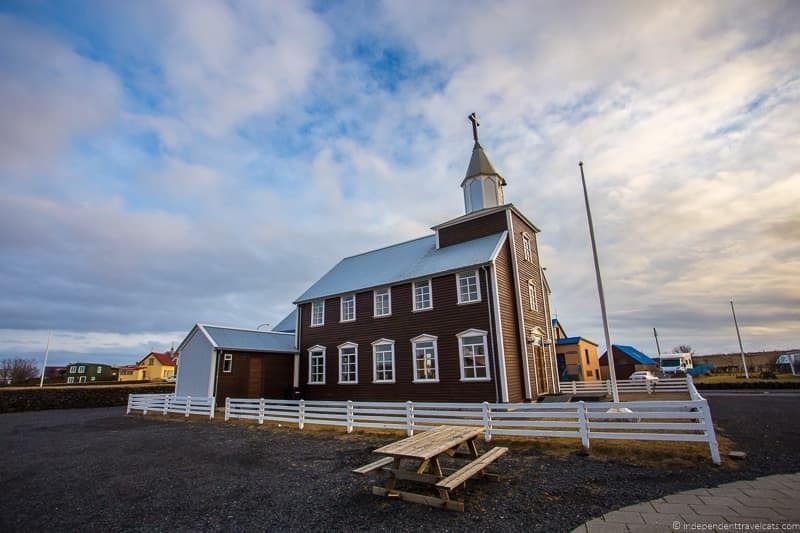 Here you can learn about Icelandic culture, technology, and see the inside of old turf buildings, homes, and a church. 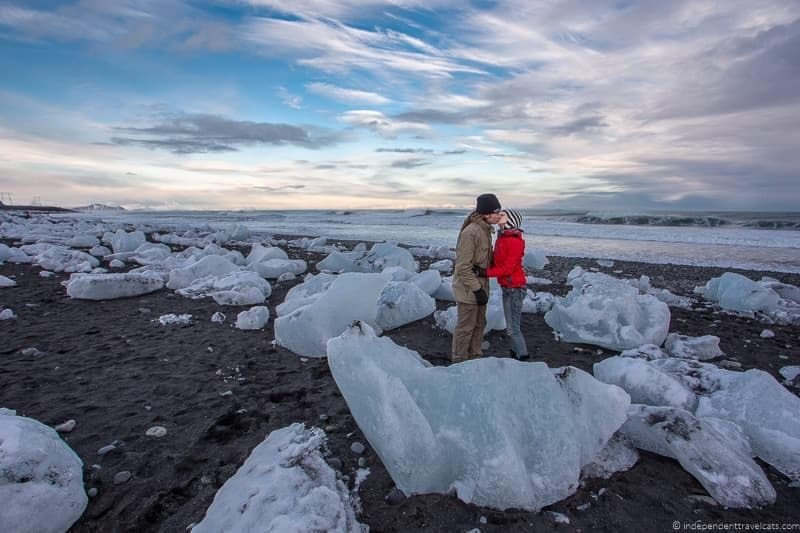 Around the Skógar and Vík area, there are also plenty of opportunities to do guided glacier walks like this one and this one, ice climbing, snowmobiling on Myrdalsjökull glacier, a longer snowmobiling experience (leaves from Gljúfrabúi), and ice caves (departs from Vík) visits in this area. Be sure to book a guided trip in advance with a professional guide if you want to do these activities as they are no safe to do on one’s own. If you are looking for the wrecked US Navy Douglas Super DC-3 plane (Douglas R4D-8 17171) that crashed here back in 1973, it is located off Route 1 between Skógar and Dyrhólaey. It is also known as the Sólheimasandur plane wreck, and it was made famous (in part) by Justin Bieber in a 2015 music video. There is a 4 km (2.5 mile) path to the plane wreck site that takes between 40 to 60 minutes each way. Sometimes there is someone renting out bikes here for use to cycle to the plane wreck and back. Read this guide to visiting the plane wreck. Note that the plane is located on private property and you are not allowed to drive or camp here (access was restricted in 2016 so you may see outdated blog posts or guidebooks saying you can drive to the wreck). If you are rushed for time, I’d skip this site as it will eat up about 2 hours of your day and there is nothing else to see along the path. It is probably the most boring hike in Iceland! Dyrhólaey is the southernmost point in Iceland and you can take a short detour on road no. 218 to drive to the top (steep drive, not recommended in bad weather) for a nice view and to see a huge stone archway. 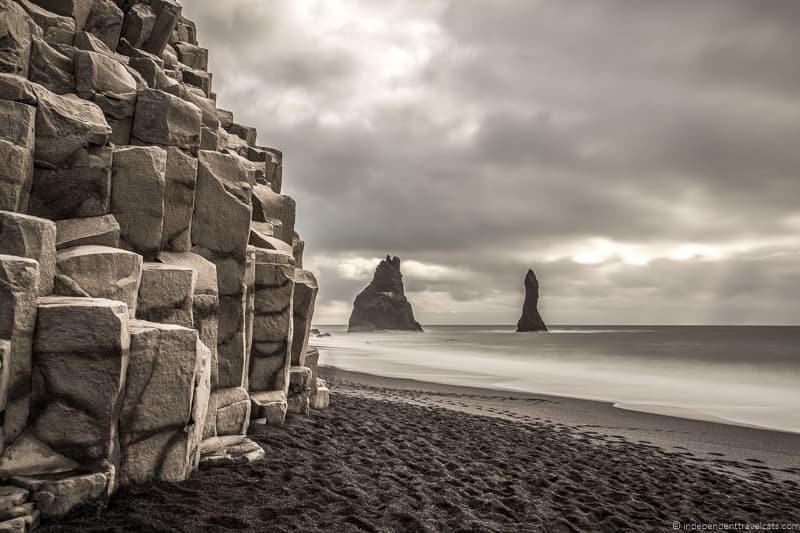 As you now head towards Vík, you may want to make a stop first at Reynishverfi’s scenic black beach with basalt columns. This is a popular tourist stop for its scenery. But be very careful of the waves and tides here as they can be dangerous. From Vík you’ll have a good view of the sea stacks and it is also a good place to stop for food if you are hungry. A unique new attraction here is the Icelandic Lava Show, where you can learn about lava and volcanoes and actually see and hear molten lava in person. Continue on to Kirkjubæjarklaustur and you’ll pass through part of the moss-covered Skaftáreldahraun lava field, believed to be the largest lava field created from one eruption. 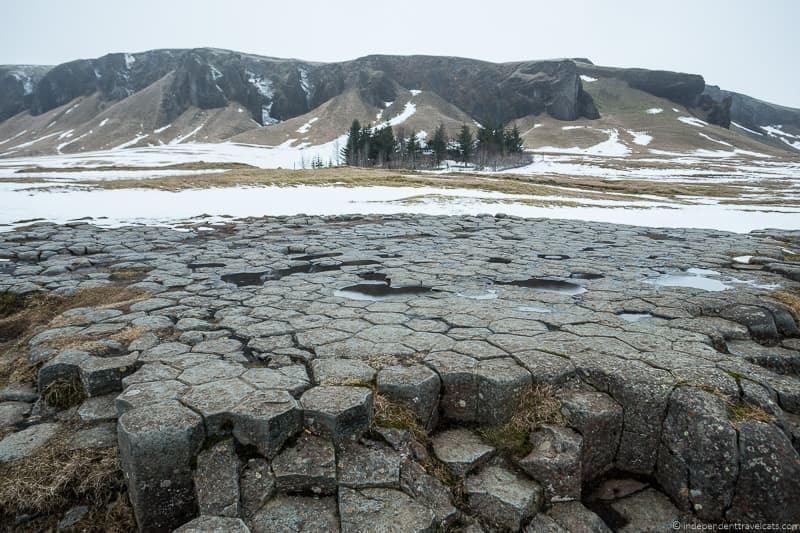 In Kirkjubæjarklaustur you’ll find a number of lesser known attractions such as a lake, small waterfall (Systrafoss), Kirkjugólf (Church Floor) basalt columns, and lots of craters. Where to Stay? : We’d recommend spending the night in or around Kirkjubæjarklaustur although Vík is also a good option. Around Kirkjubæjarklaustur, you may want to check out Hotel Klaustur (we’ve stayed here), Hotel Geirland, Hotel Laki, and the Eldhraun Guest House. Around Vík, you can check out Hotel Katla Hofdabrekka, Icelandair Hotel Vik (we’ve stayed here), Grand Guesthouse Gardakot, Guesthouse Steig, and the Volcano Hotel. What do Do? : Today you’ll continue to head east on Route 1 and the day will be focused on spending the day in Vatnajökull National Park. From Kirkjubæjarklaustur, your first main stop will be in Skaftafell to visit the Vatnajökull National Park Visitor Center (there are other visitor centers as well).Here you can learn more about the park, decide on which areas you want to visit, and get information about the hiking trails. Note that you need to pay to park here – go inside and register your car information (you’ll need to know your license plate number) inside the visitor center at the digital terminals. If you want to hike, be sure to check in about any closed roads/hiking trails and weather conditions before you set out. Highly recommend doing at least one hike here if the weather is good (a couple of them are even wheelchair accessible). From the visitor center, you can take a hike to see the edge of Skaftafellsjökull glacier tongue which is a fairly easy relatively flat 1 hour round-trip hike. Another popular hike in the park is to scenic Svartifoss waterfall, a waterfall against a basalt column background. This one is fairly easy as well but the path is steep in places. It takes about 1 hour 30 minute round trip from the visitor center if you go directly to the waterfall and back, but there are much longer hikes available that include the waterfall. If you are looking for a peaceful hike I’d pick another hike as it can be quite busy and crowded around the waterfall. If you are looking for an activity, local tours companies offer activities such as guided trail hikes, glacier hikes, ice cave explorations, and ice climbing in the area. If you don’t have anything pre-booked (recommended that you prebook any activities), there is usually a couple of companies with kiosks in the Skatafell Visitor Centre parking area. If you are not tired of glaciers, you may also want to drive to see Svínafellsjökull glacier tongue where you can get a good view of the outcrop of the massive Vatnajökull glacier which is about a 5 minute walk from the parking area. Within this large national park, you have barren lava fields, glaciers, meadows, waterfalls, and gorges. Before you leave, you’ll want to head further towards Jökulsárlón, where you can see the famous glacier ice lagoon with floating icebergs. There is also a black sand beach here, and you may also get to see seals swimming along the coastline here. Boat trips, such as this one, are also possible in the lagoon from May to October. But there are no regular boat tours available in the winter. Where to Stay? 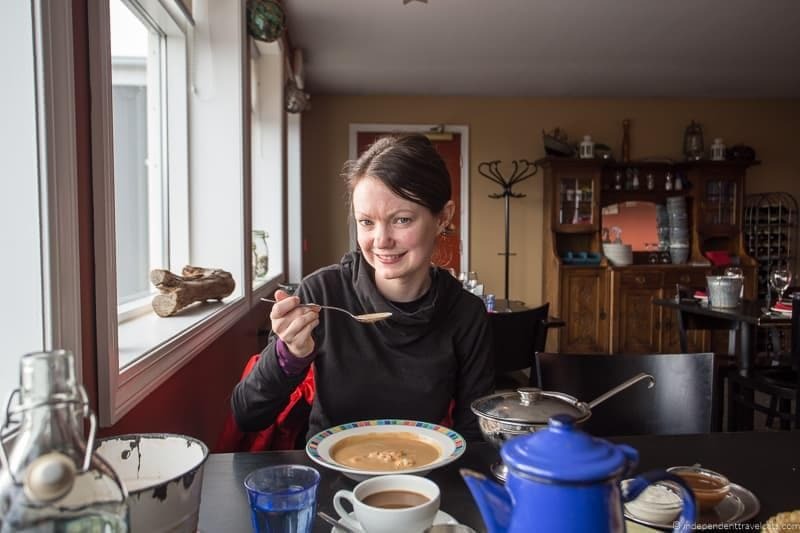 : We’d recommend returning back and spending the night in or around Kirkjubæjarklaustur (or Vík) so you can spend two nights there rather than having to change lodging although there is also limited lodging in the Skaftafell area. What do Do? : Last day of our 7 day Iceland itinerary. Today you’ll return along Iceland’s scenic southern coast and return to Reykjavik or head to the airport. You can also visit anything you didn’t get to see on Day 5, or plan a visit to the Blue Lagoon if you missed it on Day 1 or the Laxnes Horse Farm if you missed it on Day 4. If you have limited time (if your flight is leaving today) you can just head to the airport directly (182 miles/294 km, allow at least 3 hours and 30 minutes to get to the airport). Head west towards Selfoss along Route 1, and along the drive you’ll pass the glacier Mýrdalsjökull in the distance which sits on top of Katla, a massive sub-glacial central volcano. You’ll also pass back through Hvolsvöllur where, if you have time, you might want to stop at the recently opened interactive LAVA Centre where you can learn all about Iceland’s volcanos and geology. You’ll also pass along a number of sites from Day 5 if you missed any. Once you reach Selfoss, if you have time take route no. 34 to visit some of the fishing villages like Stokkseyri. If you are in a rush, I’d stay on route 1 to continue towards Reykjavik or the airport. Stokkseyri is known for its langoustine soup (stop at Fjöruborðið [Fjorubordid] Restaurant if you are hungry) and also has a few quirky cultural sites and art galleries, including the Ghost Centre and the Icelandic Wonder Museum (focused on elves, trolls, and the Northern Lights). If you are not in a rush, you can then head onto Eyrarbakki which has a number of attractive old houses and a village church (which houses an altarpiece painted by Queen Louise of Denmark). 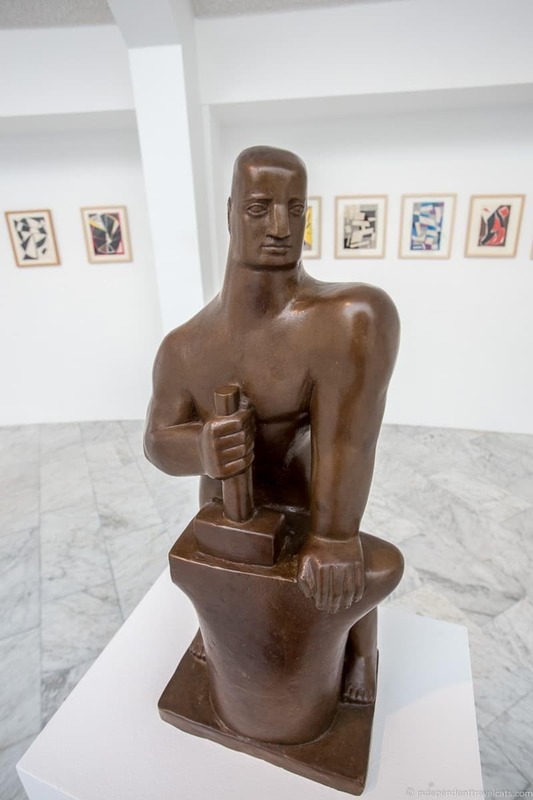 You may want to stop and visit one of the city’s museums such as the Maritime Museum or the Húsið Husid (one of the oldest houses in Iceland with exhibits). You can then follow along the coast to the fishing village of Grindavík which has its own harbor, a golf course, geothermal baths, a cute orange lighthouse, and is home to the Saltfisksetur Íslands Museum, a museum about local culture and the saltfish industry. Hiking trails are also found here and you can book adventure tours here as well (fishing, biking, hiking, ATV trips, biking tours). Now you can return to Reykjavík and see any remaining cultural sites, pick up any souvenirs, and perhaps splurge on a final nice dinner before you return home. Or alternatively explore more of the Reykjanes peninsula (e.g., Bridge Between Continents, Krýsuvík geothermal area), relax in the Blue Lagoon, or head to the airport. Where to Stay? 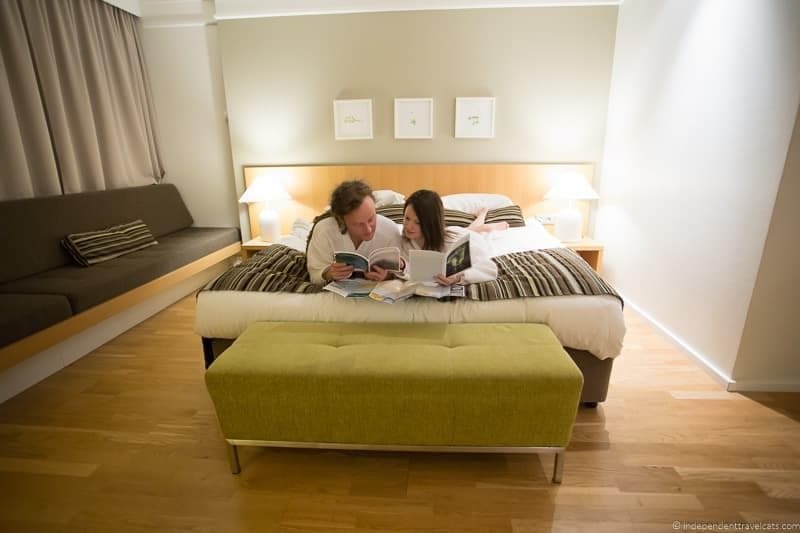 : If you are spending the night , there are plenty of lodging options in Reykjavík. If you stayed here on Day 1, you may want to return to the same place. I would book in advance as many hotels do get full in the capital. Note that it takes about 45 minutes to drive to the airport from the city center. If you have an early flight or don’t want to drive back into Reykjavík, you may want to stay in Keflavík instead where there are a lot of accommodation options. Last time we stayed at the Northern Light Inn which is conveniently located next to the Blue Lagoon and about a 17 minute drive from airport. We recommend the lobster soup! More to do in Reykjavík? We also marked out our suggested route on Google maps. Although you can probably follow along easily enough with the text, this might be helpful to use in conjunction with the itinerary above and can help you better visual the driving route. You can access our route map here or by clicking on the map image below. There are different map layers for each of the 7 days of the Iceland itinerary as outlined above. There you have it, our 7 day Iceland itinerary! The itinerary is designed specifically for winter but it can be used at any time of the year as it takes in the most popular spots in Iceland. 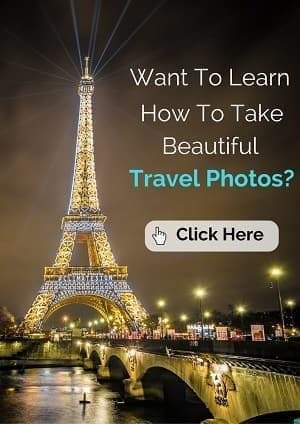 Like what you see above but don’t want to book the car, hotels, and tours yourself? Consider a self-drive trip around Iceland where a company sorts out your rental car, driving directions, maps, itinerary, hotels, breakfasts, and can make tour reservations for you. They are also always available in case you have questions or problems during your trip. All you have to do is pack and show up! 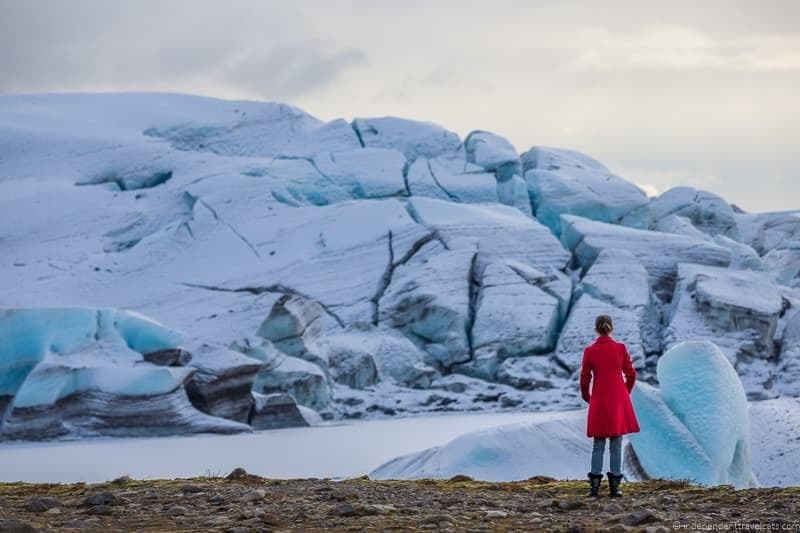 Two of the Iceland Travel self-drive tours that are most similar to the itinerary above are the Glacial Exploration and Auroras trip and the Winter Wonders and Delicious Detours trip. 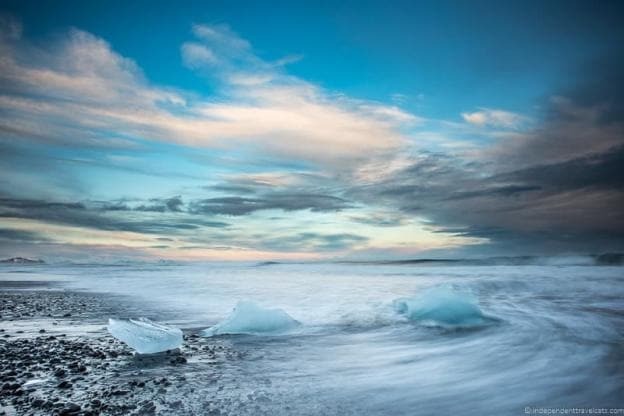 Which of these places would be on your Iceland travel itinerary? Have you been? If so, we’d love to hear about your favorite places or tips on traveling in Iceland. If you have any questions about traveling to Iceland or our 7 day Iceland itinerary, just leave them as a comment below and we’ll try our best to answer them. As always, we love to hear from you! Disclosure: We received a free self-drive tour in Iceland with Iceland Travel as travel writers, which included our accommodation, rental car, and fuel for a 7-day period. We covered our own flights and all our travel expenses (e.g., fuel, rental car, lodging, entrance fees) for our remaining time in Iceland. As always, this article contains only our own honest thoughts and opinions. You can read more in our Ethics Code about how we accept work. We will be traveling in August 2019 and doing a 7 day self drive tour. We wanted to purchase a gas card and we were wondering if the gas card (with a pin) will work at all gas locations? As we did not want to have to purchase different cards. We think our self drive trip will be about 1600 km and current prices are 225 isk. How much should we put on a gas card, just to be safe? The gas cards are normally just for a particular gas station chain. So the N1 gas card with pin only works at N1 stations but allows you to fuel up whether the gas station is manned or unmanned. This is good if you don’t have a credit card with a PIN or don’t want to use your card. But you can only use these at N1 stations, but this is one of the most common gas stations so you should not have an issue with a 7 day trip, but I would stop when you see them. Here is a list of station locations so you can put them on your map for your trip if you purchase a N1 gas card. In terms of how much, N1 sells them in different denominations so I would maybe just buy what you think you will need and then you can always buy additional ones as you go (just be sure to always have enough for the next day). They are sold in the manned stores at the fuel stations. For a budget estimate, I’d check in July or August for fuel prices to do your estimates as March prices may be significantly different than August prices. It is also going to depend a lot on your rental car as you will need to know how many km per liter/gallon it gets to do the estimate. If you don’t need a pin, then you can just pick up a discount loyalty card from some stations, for instance we used the one from Olis. This gives you a discount but you pay for the fuel with your own card or cash. My 15 year old daughter and I are heading ti Iceland in 9 days!!! We’re going to attempt the 7 day ring road tour from 3/31 to 4/7. Do you think that’s doable? I’m hoping we’re enough into spring for the roads to be clear. Also, ont he 7th, our flight leaves at 8:30 am, so how would you recommend we amend the trip to make sure to get back to Reykjavik>? Sounds like you have a fun family trip coming up with your daughter. I am a bit confused about your question. 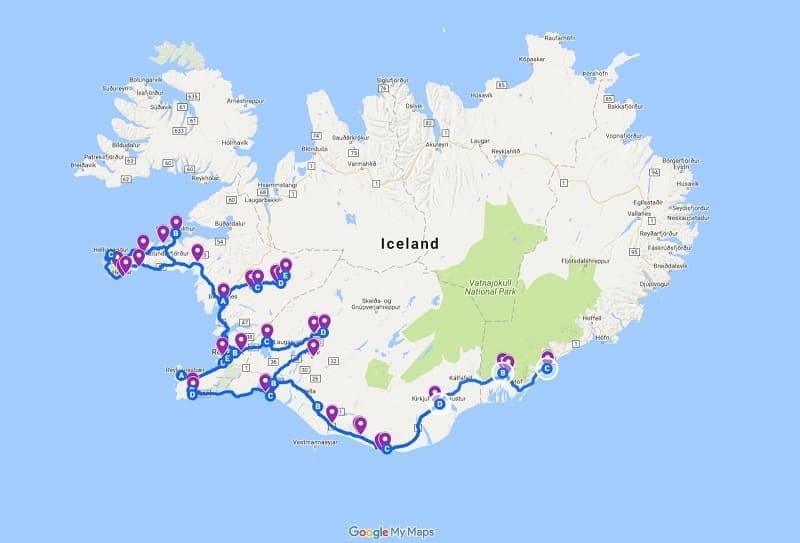 So are you following this 7 day itinerary or another one (perhaps this one), as this Iceland itinerary does not go around the Ring Road? It focuses on the South Coast, West, and Reykjavik. The Highlands road generally don’t open until June, and there can be winter weather (snow/ice) in Iceland through May so I would still be careful on the roads and watch the weather forecast each day. Flooding can also be a year round issue. A quick look at current road conditions show some parts of the Ring Road have snow or ice on them and some are showing as slippery or difficult to drive, so definitely take that into consideration. 7 days/7 nights is a fast Ring Road trip, with only 6, I think you might be better off trying to see more of specific areas such as recommended in the above post. But you can of course drive the Ring Road in 6 days, you just will be doing a lot of driving and will have to rush around some of the sections of the trip. Also if bad weather causes you to need to slow, having only 6 days is not ideal. Hope that helps, but feel free to follow up! We arrive on Sunday 31st March at 7am and depart Sunday 7th April at 8am. So we have 7 full days and 7 nights. From the sounds of it, next week is still very wintery and you would not advise driving the 7 day ring road tour? Although I’ve rented a 4WD car, we don’t want to run into bad roads and/or weather. We’re hoping to see some Northern lights and possibly some Puffin? Your itineraries all sound so good. I want to pick the best one for this time of year. Which would you recommend? Yes, we recommend this 7 day itinerary for winter, it works well for any time of the year but was specifically designed for winter and that is when we did it. But these roads can also still get bad this time of year, so do still check the weather forecast and road conditions each day. It also works better for your time as our suggested Ring Road itinerary is 8 days/7 nights. For the Northern Lights, if they are active in your area, you need to be outside of a city and away from large amounts of artificial lights. You also need a clear night which is the more tricky part as it can often be cloudy in Iceland. You can go out to see them yourself or take a Northern Lights tour to try to see them. You can see our guide to puffins in Iceland for locations and tips. But this is still early for them and although they normally start returning in April, you may not see any yet. It really depends on the year, we’ve had some puffins return here in Scotland already though. But usually the best time to see them in May to August. Hope that helps, and wishing you a great trip! Hello! Thank you so much for this information. My friend and I are planning to drive around Iceland ourselves for 7 days this February/March so finding this was perfect–we are planning to follow the driving directions pretty closely! I’m not sure if this was already asked/answered, but about how much did your fuel cost? Great, glad that you are finding our Iceland road trip itinerary for winter helpful in planning your upcoming vacation! Yes, we actually just answered this question – see the January 7th 2019 comment and reply to Suyin for more detail about estimating fuel costs (let me know if you can’t find it). But essentially we’d recommend budgeting about USD $200 for fuel (as of January 2019, I’d double check currency conversions and fuel prices before your trip) if you are planning to rent a compact or normal sized car. I would add a little more if you are planning to rent a SUV or campervan. Hope this helps, just let us know if you have further questions. I see that the fuel question was answered below – sorry about that! A couple other questions–my friend and are planning the trip to be on as much of a budget as possible (we are college students), around $1000 total. We’ve managed to find lodging for all 7 nights for a total of about $200 per person, but I was wondering if you had any other budgeting tips, or ideas on places we can go for free? We are probably going to do only a couple paid activities–the Blue Lagoon, maybe a museum or two, and one dinner at the end (otherwise we’re buying our own groceries!). Thanks in advance! One other note–for the two nights in Vik/Kirkjubæjarklaustur, we couldn’t find cheap accommodation near there, so booked a place for two nights in Hvolsvöllur. I know that will add a little extra driving, especially for Day 6, but was wondering what you thought. The booking is flexible, so we can cancel/change if we find something better. it is definitely doable to plan a trip to Iceland for around $1000 to $1200 per person for 7 days, but you do need to be more planful and be sure to book your flights, accommodation, car, and other larger costs (tours, activities) in advance to help make sure you stay within budget. You can see our post on budgeting tips for Iceland for lots of budgeting tips. Flexible booking is definitely good for Iceland, especially in winter, in case of bad weather or road closures. We normally book everything through Booking.com and most bookings allow up to 24 hour cancellation. Our two budget recommendations for the Vik area are The Barn and The Puffin Hostel if either of those are available for that night(s). Thanks so much, Jessica! We’ve booked everything but the car, which we are working on now–researching the cheapest option. One more question–I’m guessing the answer was no, but does this driving route include F-roads? No, the F roads are closed to traffic in winter (normally from about December to June) and none of the places listed in our winter itinerary involve driving on F roads (the one exception is a small section of the F35 Kjalvegur road to the Gulfoss waterfall which is normally open year round). There are a few places mentioned in the itinerary that do involve smaller roads off the main road to get to, but these roads are normally open year-round. But of course, you should use best judgement if there is snow or ice as any road can be dangerous. Here is our guide to driving in Iceland in winter that might be good to read before your trip for driving and safety tips. We also have a winter packing list if you need help deciding what to pack. Hi Suyin, The estimated average cost for 1 liter of gasoline for when we were last in Iceland (in July) was 205 ISK (~ $2.00 USD). You should check the most recent prices of gasoline, and you can find out where to that and ways to save money on fuel and rental cars in our Iceland on a budget article. Then it will also depend on how many liters per gallon your vehicle is as a compact car is typically more fuel efficient than a SUV. So you can check on that for your particular rental car. But at current fuel prices in January 2019 (average is 220 Icelandic krona) for a 1,613 km journey with a car that gets 6 liters per 100 km, then you’d be looking at around 21,291 Icelandic krona. This is currently equivalent to about $180 USD. So I’d budget about USD $200 for fuel if you plan to stick closely to this itinerary and have a car with a similar fuel economy. Hope that helps, and let us know if you have further questions as you plan your trip. So helpful, thank you Jessica! I have been overwhelmed trying to plan our trip and it looks like you’ve done all the work for me. This is fantastic. I love the suggestions on what to do and where to stay. We will have six full days. We arrive on a Friday morning (late May) and leave early on the following Thursday morning. What would you cut out of the itinerary? Would you remove Day 2 or Day 3 from the itinerary or modify it some other way? I’d appreciate any input! Thanks so much! So happy you are finding our Iceland itinerary helpful. This will work great in May (or any time of the year). If you only have 6 days, yes, I’d cut out either Day 2 or Day 3. So Day 2 of our Iceland itinerary has you exploring the Borgarnes and Husafell area where among others things you would have a chance to visit the saga museum, go to a couple of waterfalls, do a cave tour, do the ice tunnel tour, and/or visit Krauma spa. Whereas on Day 3 of the itinerary, you explore the Snæfellsnes Peninsula which is very scenic and has a couple of waterfalls, Mount Kirkjufell, museums in Stykkishólmur, coastal paths, Shark Museum, chance to take a cave tour or mountain snow tour, rocky beaches, and some fishing villages. Both are worthy of a full day, so it really depends on which sounds more appealing to you and your travel partner(s). Hope that helps and let us know if you have any other questions as you plan your vacation. 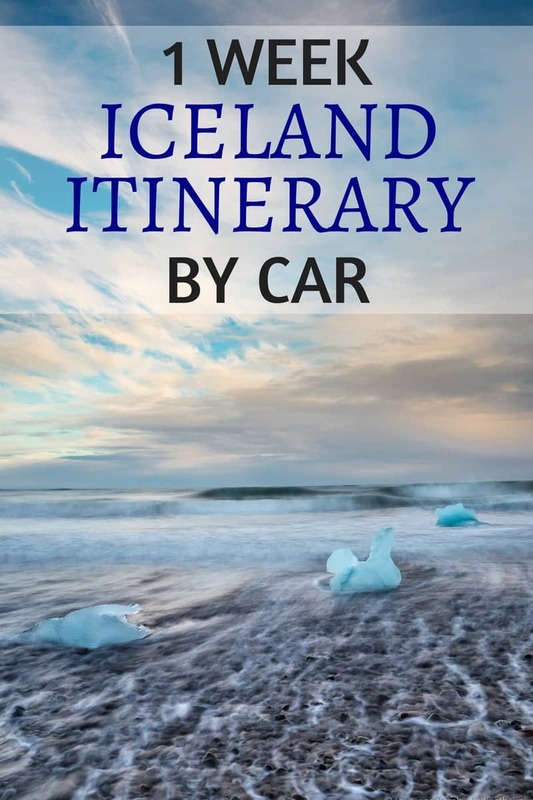 This is indeed the best resource to plan one’s trip to Iceland 🙂 I went through couple of pages you both have wrote about all your trips to Iceland and we have finalised on week’s itinerary. Me and my wife are working on budget trip to Iceland in month of March. Even we took your Airbnb reference to plan our stay. Really appreciate the time you spent and helping the wider audience plan good travel. Do you think it is doable without rushing too much or would you suggest to avoid some parts? we don’t want to end up spending all the daylight hours driving. Doing our itinerary in 8 days is great as having an extra day gives you a chance to spend more time in one area, go a bit more slowly, and do extra activities or tours if you wish. I think the itinerary you propose is definitely doable without rushing too much. You will have to move lodging each day, but if you are OK with that, then I think this would work fine. 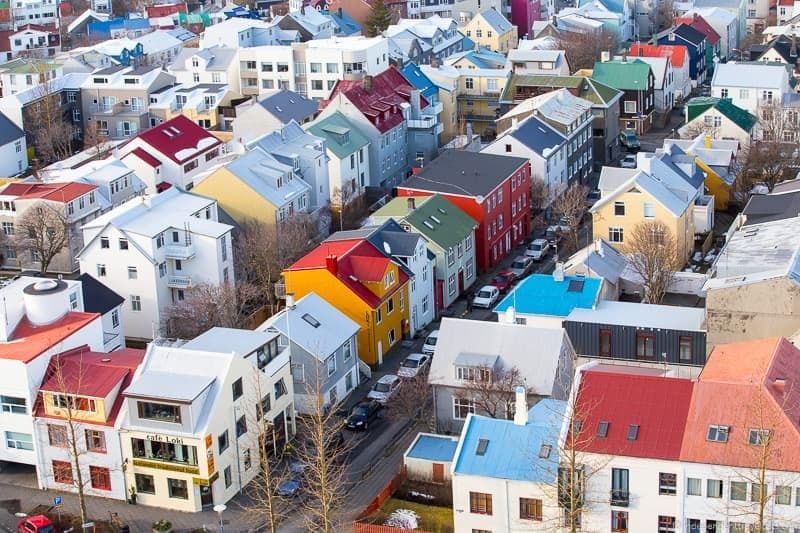 You won’t have much time in Reykjavik with the above itinerary since you only have a half day the first day. So I’d just make sure that will give you enough time to see what you want to in the city. In terms of winter weather, it is really unpredictable which is why just tracking the weather while you are there is important as it can change quickly in Iceland. In terms of the itinerary, the two areas that tend to be worse are the Snaefellsnes Peninsula and the area between Vik and Skatafell. But if you check the weather and road conditions regularly, act accordingly, and drive carefully you should be fine. All the hotels and gas stations usually to have the latest road and weather updates available if you don’t have access on your phone while traveling. The main roads are all in good condition in these areas and are cleaned quickly if there is a storm. You can read our tips for winter driving in Iceland for more. Hope that helps and wishing you a wonderful trip to Iceland! 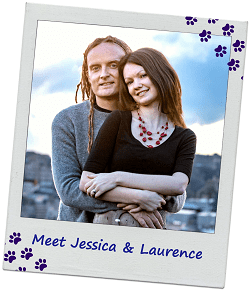 I am travelling to Iceland with my boyfriend from 30th Dec – 3rd Jan 2019, we have already booked accommodation which is located near the airport and have hired a car. I wondered if you could advise us on an itinerary as Keflavík will be our hub. 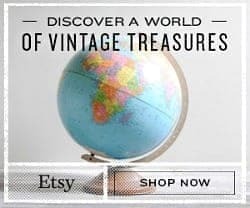 We are both foodies and would love to see the best sights while we are there but also do not have the biggest budget so are thinking of ways to keep costs down. Glad you are enjoying our Iceland content! So you have 4-5 days although it will depend on how many of those are full days in the Iceland. 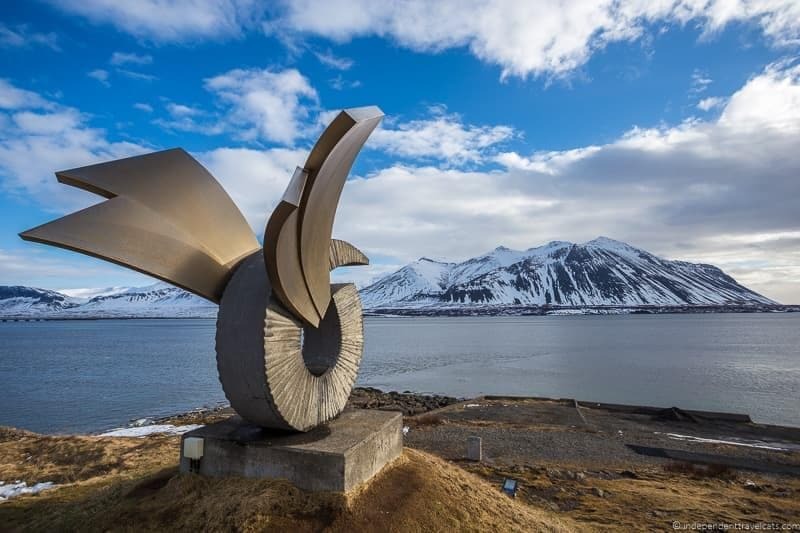 In addition to this itinerary I’d take a look at our 5 day itinerary (good for all seasons) and since you are basing in Keflavík, our suggested day trips from Reykjavik (about a 50 minute drive from Keflavík) should give you some ideas of what is possible as well. -If you want to visit the Blue Lagoon, I’d considering doing it on the day you arrive to relax since it will be near your hotel. Just note you need to have a reservation made in advance. The restaurant there is very well-rated but pretty expensive. 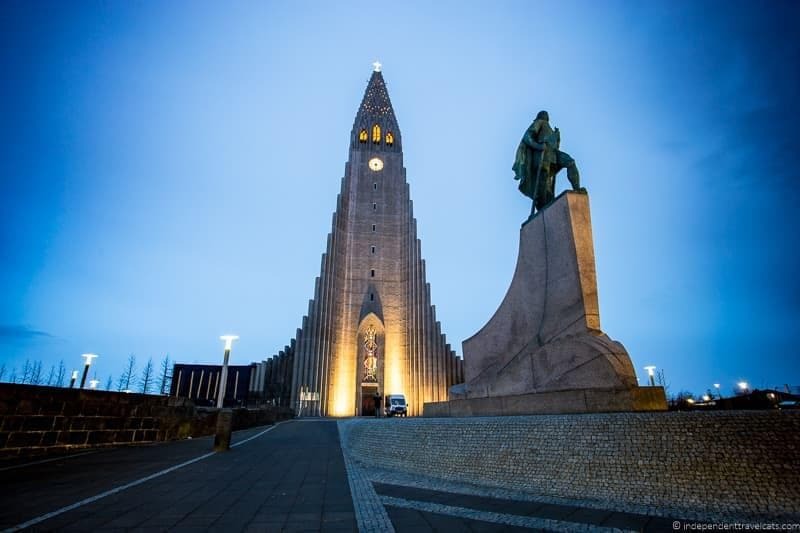 -I’d definitely recommend spending 1 day in Reykjavik, not only does it have a lot of cultural attractions but it is definitely the top dining spot in Iceland with lots of cafes and restaurants, from budget street hot dogs to finer dining. If food is something you like to splurge on, you might want to do a food walk, such as this one. See Day 1 of itinerary. -Golden Circle is good for a day of exploration – one of the most popular driving routes and easy to do from where you are basing. Food-related you might consider stopping at Friðheimar where you can see a geothermal greenhouse and have lunch with food grown there and/or tasting the locally made ice cream at the Efstidalur farm restaurant. See Day 4 of the itinerary. -South Coast – There is lots to see and do along the South Coast (waterfalls, beaches, museums, ice caves) but with limited time (and driving from Keflavik), I’d pick a handful of places you really want to see/do and prioritize those. See Days 5 and 6. 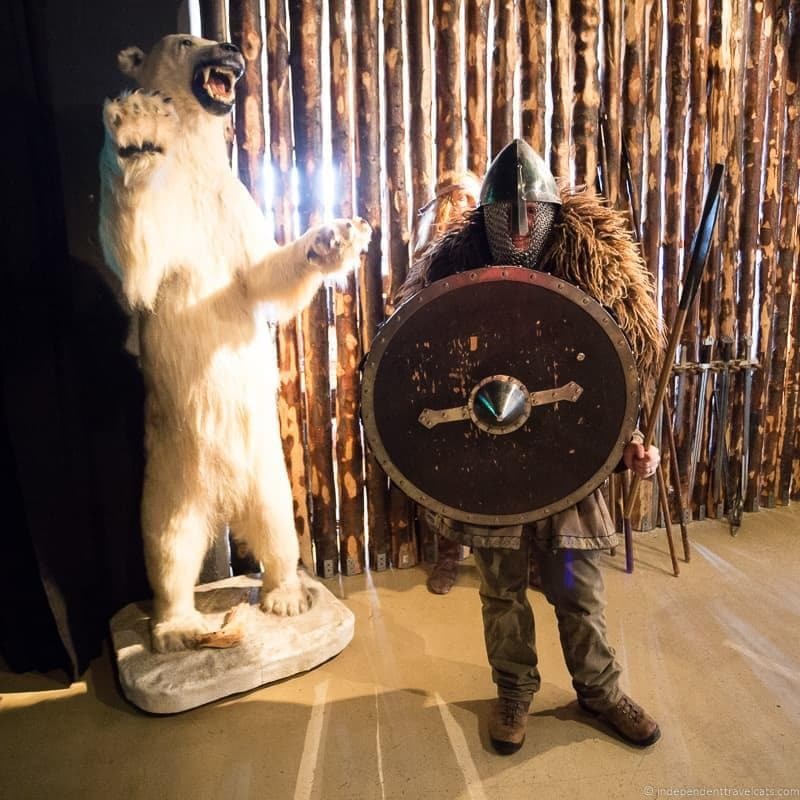 -Head north to spend a day seeing some of the the West – You’ll have limited time so I’d recommend exploring around Borgarnes, there is a saga museum, caves, chance to do an Ice tunnel trip, snowmobiling opportunities, waterfalls, etc. Krauma Spa is a nice new spa in Iceland and they have a yummy cafe there. See Day 2 of the itinerary above. You’ll be in Iceland for NYE/New Year’s and you might want to spend at least part of that in Reykjavik as there will be bonfires, fireworks, and special events such as this evening fireworks cruise. Note that when making plans that some businesses/attractions may have limited hours or be closed on NYE/New Year’s. Iceland is expensive, although the krona has recently fallen compared to most other currencies, so things are a little less expensive than when we were last there over the summer. Here are our Iceland budget tips and as well as our driving in Iceland in winter tips. Hope this helps and feel free to reach out with more questions as you plan your upcoming winter trip to Iceland! We just completed our 7 day/6 night trip in Iceland. It was fabulous in so many ways. We used your exact road traveling literary and stayed in the towns that you recommended. We probably did about 70% of the things that you recommended and did some other side things that we discovered. My wife and I are 60 and are budget travelers. We had chosen to travel in shoulder season, October 26-November 1st. This can be good and bad. The prices are lower but, the weather can be crazy up and down. I had 2 goals in booking our lodging, keep it around 100.00 USD and have breakfast included. I ended up averaging 127.00 USD for the 6 nights. Having a great breakfast totally ready for you every morning was a great benefit and big money saver. We ended up getting a smaller car, but it did have great tires with metal studding in them. The rental company we used (Payless/Avis) has a deal with the service station OLIS, (stations throughout Iceland). They give you discounts on gas and unlimited free coffee (big for me). I would see an OLIS and my wife would say, “time for coffee”. They also had food stores inside several that we used to buy supplies. I mentioned the weather… we had it all, but it seemed that God always gave us favor and opened up windows of good weather to enjoy specific locations. I will not mention anything that we did unless it is outside of what you have already suggested. I will mention things from our specific days of travel so it makes sense. Day 1. We chose to go to the “bridge between 2 continents” when we arrived. It is very close to the airport and you can put one foot on the North American Plate and one on the European Plate. We drove by Blue Lagoon and went in, but decided not do it. We headed to our Hotel, Radisson Blu in Reykjavik. You mentioned that there is the “heated pool” experience the Icelanders do and part of our motel reservation at the Radisson gave us access to Vesturbæjarlaug, Public pools. It was a phenomenal experience. They had 7 pools, a steam room, sauna and a lap swimming pool. This was included in our reservation with Radisson. We used this twice. Day 3. We stayed in Borgarnes and as you head towards the Snaefellsnes Peninsula about 45 km into your trip is a great Basalt column area called Gerduberg. It is marked and right off the road. Really good. We also went to a side road in the Snaefellsjokull NP that was amazing (right after Hellissandur). We took it to the end of the road and there was a nice beach (Skarðsvík Beach) and a great lighthouse, (Svörtuloft Lighthouse), ocean view with the lava wall and ocean crashing into. One of the best things of the day. Day 4. At the end of the day before reaching Selfoss there is a place called Kerid Crater. It is unique because the lava rock from it is red. Only time I have ever seen red lava. We stayed at the Sefloss Hotel and Spa. I mention this for 3 reasons, very good price, amazing breakfast, and they let you have full access to their spa for only 1500 ISk. Enjoyed the experience. Day 5. We did a nice visit to Keldur House. It is the oldest turf house in Iceland. It is the first thing to do after you leave Selfoss. We were the first ones there and had the place to ourselves. We found a family grave marker dated to 1712. These houses look like where Frodo and Bilbo lived. Day 6. There are several things we did on this day that were outstanding. Visiting Dverghamrar, one of the most stunning rock formations in Iceland (The Dwarf Cliffs), some 10 km east of Kirkjubæjarklaustur. We visited the Jokulsarlon Glacier Lagoon as you suggested but loved the black sand beach across the highway. Lastly, this is a “sleeper”. We hiked out to the tongue of the Kviamyrarkambur glacier. It is about a one-mile hike. No one was around and we were able to walk out on ice that was broken off. It is located 23 km before Jokulsarlon. Again, Jessica, thanks so much for all your help!! So glad to here that you followed our suggested 7 day Iceland itinerary. Glad that you had such a wonderful time and thanks for sharing about your own Iceland trip. I think going in October you would not have had too much winter weather yet which makes a few of the additional stops you made more accessible (as a few you mentioned are not good after it starts to snow). It sounds like you did a great job in keeping within budget as ~ $126/day for lodging in Iceland for two is a good average! Yes, we agree, a good breakfast is nice to have each morning before you start your sightseeing. WOW! Your blog has been SO helpful! It is the best, esp for winter travel in Iceland! I am planning a self drive trip to Iceland this Nov 21 (Tuesday) to 27th (Tuesday) My flight arrives the 21st at 5 AM to KEF, and leaves at 5:40 PM on 27th. I would like to follow your itinerary, except I wouldn’t be able to see all of what you saw in day 7. I want to take advantage of the first day, since it will be only 7 am by the time we get out of the airport and get our rental car, and we can drive before the sun rises. I looked up the weather at the end of November, and sunrise is at 1030 am, and sunset around 4:30 pm. Do you think Day 1 would be a good day to drive to Snaeffelsness Peninsula? or should I start the opposite direction to the east? I want to maximize driving time since sun will not have risen yet. I would like to do an ice cave tour and snowmobiling. Where do you suggest the best place is? Also, will that take a full day since the daylight is so limited? Does that mean I should spend two nights in the area I do the snowmobiling/ice cave? Also, for the 7th day, I would like to spend time at the Blue lagoon and Reykjavik. What town should I stay in the night before to be able to drive to Reykjavik, sight see alittle bit, and also go to blue lagoon before the flight home? Will anything be open in Reykjavik early in morning? I was thinking Day 1: Snaefellsness Peninsula Itinerary (? stay at Hotel Budir), Day 2: Borgneses Itinerary, ( ? stay at Hotel Hussafel ) Day 3 Golden circle and Pingvellir Park ( ? stay at Ion Adventure Hotel in Nesjavellir or go to Hella and stay at Hotel Ranga? ) 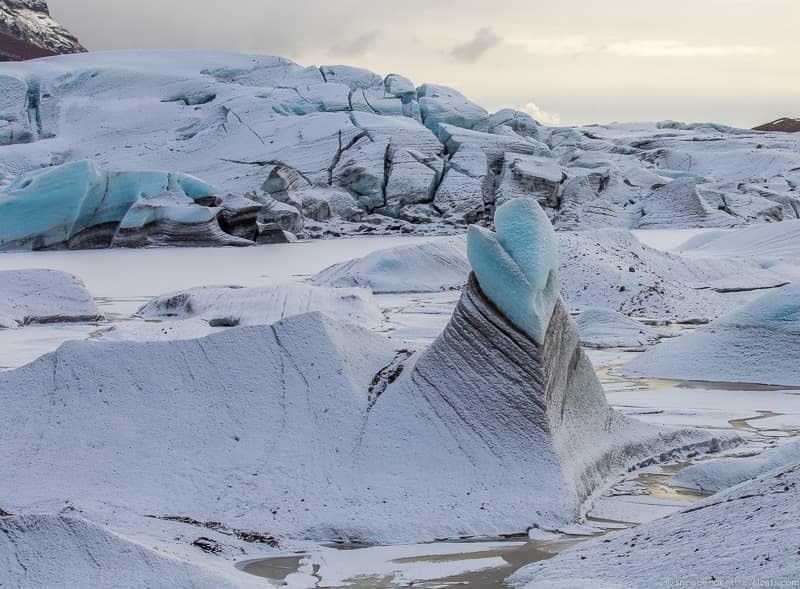 , Day 4 Vik and waterfalls itinerary (stay in Vik ), Day 5 Jokulsarlon itinerary (stay at FossHotel Glacier lagoon? ), Day 6 ( Extra day somewhere in this itinerary to do snowmobile/ice cave tour? stay in Vik?) Day 7 Drive to Reykavik and blue lagoon before getting to airport at 2:30 pm. I am nervous that with limited daylight and snowy roads we are limited with how much we can see? Do you think I should stay in these towns? I would like to maximize how much we can see so I want to make sure the hotels are well situated for that, but I also want to be able to see northern lights! :o) Thank you in advance for your help!! So happy you are finding our Iceland road trip itinerary helpful for your upcoming winter trip. Yes, I do think you should check the amount of daylight hours each day and what you want to do and then adjust the itinerary accordingly. Since you are going when there are very few hours, you may want to just choose 6 days of the itinerary to do over 7 days, or just do less each day. 1.) I think you could start in the Snaefellsness Peninsula the first day as it is a longer drive and then you can start sightseeing as soon as you arrive. 2.) We already recommend a few places to do snowmobiling and ice caves within the day-to-day itinerary that may be good spots so I’d look into those. You might also want to check out our guide to winter activities in Iceland which lists a number of places and tours you can take for ice caves, ice tunnels, and snowmobiling. For instance, you might consider this tour which offers both a ice tunnel and snowmobile experience near Borgarnes, this ice cave tour (can start in Vik without pick-up), this ice cave tour from Jokulsarlon Glacier Lagoon and/or this snowmobile experience (starts near Skógar I believe). There are a several opportunities within South Iceland. You can do 1-2 hour snowmobile trips so those don’t take too much time, although you can do much longer ones. Ice cave and ice tunnel trips take longer. I’d figure out which ones you want to do and then fit your itinerary around that. 3.) Most attractions in Reykjavik (and elsewhere in Iceland) open around 10am. In winter especially you won’t find too much in terms of tourist sites open much before 10, but I would check in advance for places you want to visit and plan accordingly. 4. I think your suggested itinerary sounds reasonable – it will be a bit of driving and more rushed on some days but if you leave Day 6 free or just for activities, that will help. For Day 7, you are going to have very little time to visit Reykjavik if you also want to visit the Blue Lagoon that day before going to the airport. I’d probably skip Reykjavik since you’ll have so little time, or I’d go back and spent the afternoon of Day 6 in Reykjavik, overnight there, and then spend the morning there of Day 7 before heading to Blue Lagoon and then onto the airport. You’ll need at least 2 full hours at Blue Lagoon (I’d allow 3) and will want to be at the airport 2 hours before your flight. 5. The roads may be in perfect condition or there could be snow/ice, it really just depends and all you can do is be prepared in case the weather is not ideal. I would check the weather forecast and road conditions each day before heading out and you can always adjust your itinerary as needed. The two area of your itinerary most likely to be affected are the Snaefellsness Peninsula and the Jokulsarlon Lagoon area. 6. I think the places you are staying should be fine and if you are staying in an area of light pollution, you can always drive a short distance away or take a Northern Lights tour to see them (they’ll know the best spots and be checking the aurora forecasts). Around Budir, Húsafell, Vik, and he Glacier Lagoon are all good spots, but of course seeing them takes a bit of luck as well. Hope this helps, and let us know if you have further questions. Wishing you a wonderful trip to Iceland! Thanks for writing this wonderfully detailed blog! We are three people traveling to Iceland from 28th Dec 2018 to 4th of Jan 2019, and we’ll have 7 days in Iceland. We are planning to follow your itinerary more or less exactly. Just wanted to check with you – given the time of the year, will this itinerary be a bit rushed? If we want to relax for a few hours each day and not spend the whole time driving, should we plan to drop a leg like Stykkishólmur, and spend more time on the south coast? Any advice will be appreciated! So happy you are finding our Iceland itinerary helpful in planning your 7 days in Iceland. Yes, we did this in March when we had more daylight hours and since you will have fewer daylight hours, I would scale it back a bit to what is realistic to see each day. I think you can still cover most of these places, but it will feel rushed on some days. I do agree with you and I would take out 1 day of the itinerary given the time of year and your desire for less driving. I’d probably skip Day 3 or Day 2, or you can skip both Days 2 and 3 and just concentrate on the Golden Circle, South Shore, and Reykjanes peninsula. This will allow you to do more 2 night stays so you can go at a slower pace, and have the flexibility to go back if you miss something or the weather is not ideal one day. 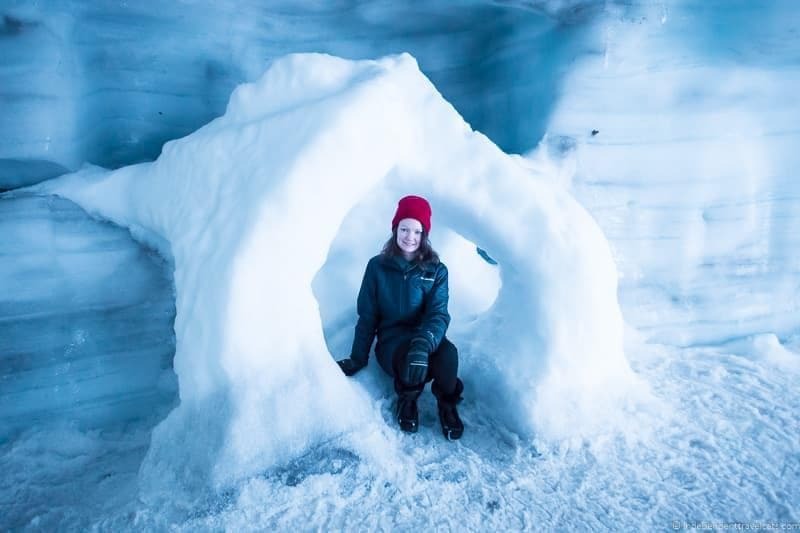 If you are booking weather-dependent activities like glacier hikes, Northern Lights tours, or ice tunnel visits, these do sometimes get cancelled so it is good to be in an area where you have a bit of flexibility to join a tour the next day in case that happens. This happened to us with an afternoon ice tunnel tour but we were able to reschedule to the next morning because we were in the area for 2 days. There is plenty to do for 7 days in Reykjavik and the South Shore so if you want to travel at a slower pace and spend less time driving, taking out the Borgarnes area and/or Snæfellsnes peninsula from the itinerary would be a good way to do it. Those can also be places to visit if you return to Iceland. Hope this helps and let us know if you have any other questions as you plan your winter trip to Iceland – happy to help! The itinerary as laid out is doable in the 7 days you have in Iceland if you do it at a quick pace. But as you probably already know there is a lot of driving time and not a lot of down time. Our general recommendation for visitors for winter in Iceland is to stay more in an area or two of Iceland rather than do the Ring Road because of the weather and some attractions being closed, but if you are planning to drive the Ring Road your itinerary sounds reasonable to us. The only thing is that if you have an early morning flight on Day 8, you might want to spend the night in Reykjavik or Keflavik area instead of Borgarnes just to save on driving time that morning. You can see our 1 week Ring Road itineraryy (geared to Spring/Summer/early Fall, not winter) that may be useful. Winter is a great time to see the Northern Lights and we really loved staying and visiting the Wilderness Center in East Iceland as well if you have not been. We did it in summer, but we think it would be really cool to stay here in the winter as well. If you like skiing, there is also some good ski spots in northern Iceland. We have a guide to some fun winter activities in Iceland if you are looking to add some activities to your trip. In January, of course, you also have the possibility of snow, ice, and road closures so you will want to keep that in mind especially as you venture east and north. So I’d plan ahead but be flexible and have a back-up plan just in case. You can see our tips for winter driving in Iceland. Hope that helps, and let us know if you have more questions as you plan your trip to Iceland! Hi there! Thanks for sharing your detailed Iceland itinerary. I am planning a trip for 7-10 days for my husband and I to Iceland this October/November. I know you said that the itinerary is good for winter, but the daylight hours are shorter (maybe 6-7 hours?) during that time than they are in March, when you visited Iceland. How would you modify your day-by-day itinerary to accommodate that? For example, if it takes 4 hours to drive somewhere, than that’s basically our whole day, which would not be ideal. Thanks! So glad you are finding our Iceland itinerary helpful in planning your October / November trip. Yes, the exact dates you decide to go will make a big difference in terms of daylight. For instance in October, daylight hours range between 8 to 11 and in November 5 to 8 hours. So if you are flexible on dates, I’d recommend earlier (early to mid October versus late November), as it can make a huge difference. We wrote the itinerary to go at a relatively unrushed pace as the driving distances are not huge on most days (e.g., some people day trip all the way to the Glacier Lagoon). So for most of the winter, I think this will work as is, but if you have less than 7 or 8 hours of daylight, you may need to adjust some days. Having a couple extra days will definitely make this better and make sure you can see all the places you want to see. It partly depends on how many of the suggested sites you want to visit and how long you plan to spend at each (a waterfall stop may only be 20 minutes whereas a hike or museum may be 1 hour or more). I’d recommend adding another day for the Snæfellsnes Peninsula and spend the night on the peninsula rather than doing a round-trip drive from Borgarnes. 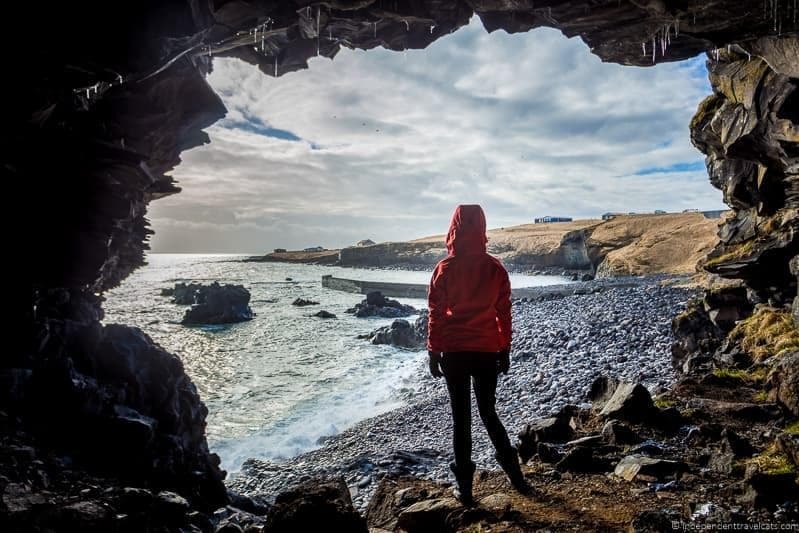 You might also want to add another night coming back on Day 7 to break up the drive and have more time along the coast and to explore some of the attractions along the South Shore and see some places on the Reykjanes Peninsula. If you are interest in some of the attractions in Reykjavik, I’d add another day there as well if you have an extra day. To make the most of your daylight hours, I’d plan to get an early start each day have a good plan the day before for what you want to see each day, consider packed lunches or simple stops for things like soup and sandwiches to avoid a lot of time finding restaurants and eating, and explore until sunset. Hope that helps! If you have specific questions about specific attractions in Iceland or days on the itinerary, just let us know as you get further along in your planning! Really great post 🙂 Iceland easily became my favorite country I visited. I just finished my 6 day solo road trip itinerary! What an amazing and fascinating place to visit. I really didn’t know much about Iceland but after reading this post I will surely visit one day. Thanks for sharing such an amazing experience. Thank you for the post! I love all of the thorough & informative details – it’s helping me plan my own trip! I’m following your guide, just switching it up a bit (western Iceland on my last day since I’m only going to be there for 6 days, not 7). I’m going the first week of October and I’ve never driven in snow / icy conditions. But I really dislike tours as I like to explore on my own. I haven’t found too many blogs about the weather conditions in October as it’s “between” weather – neither summer or winter. Should I expect snow then? And would you recommend a 4×4? I’m not planning on going on the F Roads, just the main road with any stops along the way (as you mentioned). Yes, October in Iceland is tricky as you have seen online. Predicting the road conditions at any time of the year is really difficult as the weather in Iceland can be very unpredictable and thingscan change a lot from one day to the next and from year to year. But normally the lowlands don’t get any real snow until around mid or late November so I think you should be fine in terms of avoiding snow and ice. The Highlands roads and hiking trails will be closed and may have some snow by then, but that should have almost no affect on your plans if you are following our suggested 7 day Iceland itinerary as it is designed for all-season travel, including winter. There is of course the possibility of flooding, bad storms, damaged bridges, etc. but these would be more detours on your route rather than unsafe roads. 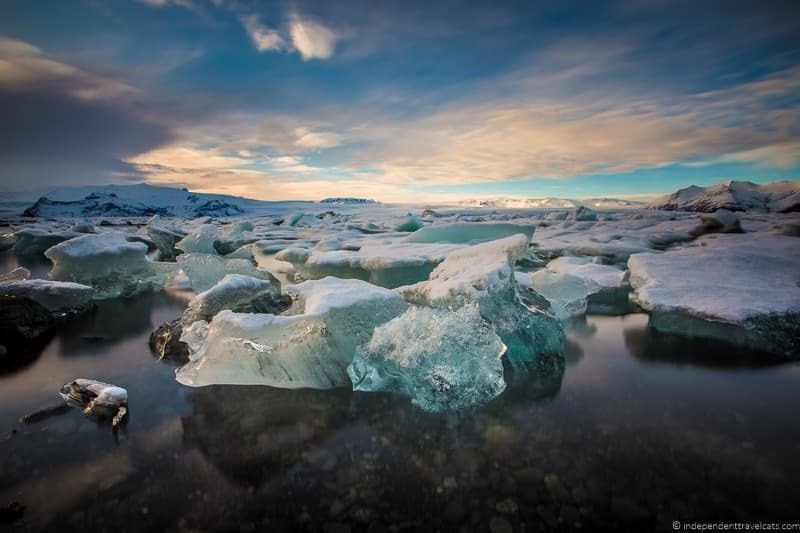 If you decide to do a guided tour, we can highly recommend Iceland Travel. They are one of the oldest companies in Iceland and we’ve had really good experiences when working with them in both winter and summer. We’ve also done many day trips through them so that is an option if you want to add on some activities to your trip, but still want to self-drive. But if you are the kind of person who doesn’t like group travel, then I’d recommend self-driving as there should not really be any winter weather in October if you stick to the main roads and the South and West within a few hours of the capital. The Iceland road and traffic websites are really good about doing road and weather updates, and we list the links to these in just about all our posts. I would just keep an eye on any alerts each day right before and during your trip. I’d also have the Iceland emergency number and a 24-hour number for your car rental company on you at all times just in case. For the 4X4 question, I think you would be fine with a good 2WD car or a 4WD passenger car and good insurance coverage. If you are sticking to paved roads and checking for weather/traffic alerts, you should be fine. It is really the bad drivers and those who go where they shouldn’t that get in trouble most of the time and they end up in ditches or wet fields where they get their cars stuck and have to get someone to pull them out. For winter weather and Highland roads in summer, we recommend a 4WD but I think in your circumstances a 2WD would be fine. It will also save you a little money, especially if you go solo. Hope this answers your questions and if you have more specific questions as you plan your trip, just let us know! 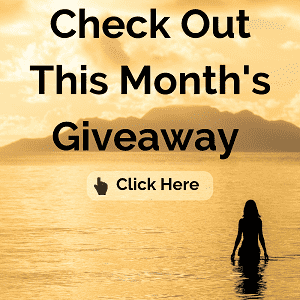 What month did you do your trip? We are going in late october this year. thanks for your help. Hi Owen, Our first trip to Iceland was in March and that is where we visited all the spots mentioned in this post and is when the photos were taken. We also spend almost all of June in Iceland this year. This itinerary would work fine in October. In October the Highland roads (F roads) will be closed (they only open for 1 to 2 months a year) but there shouldn’t be any real winter weather yet along the the main roads, Reykjavik, or coast. There may be a few days with snow in October but “real” winter weather does not usually begin until end of November/December. You’ll have a chance to see the Northern Lights in October, especially late October. They are easiest to see (if there is enough activity and clear evening skies) generally mid-September to mid-April. Hope this helps, and please let me know if you have further questions! This post is such a great source of knowledge though! It will deffinitely help people with understanding our country in terms if weather conditions, attractions or sightseeing in general. Thanks for sharing your impressions! Very nice post about Iceland tour. The natural beauty of Northern Lights, Gullfoss Waterfall and Faxi waterfall are so attractive for all. Many travelled visit to Iceland due to these beautiful places. Before three months I have visited to Iceland with my husband. We travelled and stayed there 5 days. One travel company Go to joy Iceland provided all transportation and guide to us. Thank you for this great post. My husband and I went to Iceland to completely escape from everything we used to and we absolutely loved our time. Would we return? Absolutely! I am going in next few days and my trip will be based on all your suggestions. Hi!! I am planning to do a trip to Iceland in the upcoming month (March) and this post was really helpful to give us an idea on what to do and add on our itinerary. I think is one of the most helpful websites that I have read about Iceland. Regarding to our plan, we were thinking in dedicating 2 days to the Golden circle, 3 days to the South coast (Jokulsarlon) and 3 days to the North part (Myvatn). I would like to know If you consider this is an ambitious plan for only 7 days? Secondly, I have 10 years of experience driving but zero experience in icy roads. Therefore, would you think It could be difficult for me to get used to the winter roads?? And If so, which kind or car do you recommend me to drive throw the Ring road a 4×4 or a normal one?? Thank you in advance for sharing your comments. So glad to hear that you found our Iceland itinerary and guides so helpful! In terms of your itinerary, I think that the days allotted to the Golden Circle and South Shore sound good and that will give you plenty of time to explore all the highlights, and also do some fun winter activities if you wish (hiking, ice cave tour, snowmobiling). However, the north section is a bit unclear. Are the 3 days to drive the entire rest of the Ring Road – the east section, all the north, and west back to Reykjavik? If so, that does seem a bit rushed and you might be better off spending the remaining 3 days in the South, Reykjavik, and/or the west (Borjanes, Husafell, Snæfellsnes Peninsula). You can see suggestions above in our 7 day winter itinerary. As you probably already read, we don’t personally recommend the Ring Road in the winter, just because of the winter road conditions, higher number of tourist accidents, number of closed attractions, and the fact that sections of the road is often closed due to winter conditions. You could have clear and perfect road conditions your entire trip or there could be lots of winter weather with sections of the road closed due to snowfall, ice, and/or avalanches. It really just depends. In terms of car rentals, we do recommend renting a 4-wheel drive (4X4) with winter tires in the winter. Ice is probably the biggest factor that contributes to accidents in winter on the country roads, so I would maybe just read up a bit so you know what to do if your car does hit ice. The biggest thing is to take it slow and be cautious as you may not see black ice until you are on it. We have a guide to driving in Iceland in winter that will give you more information and a list of helpful websites. If you decide you don’t want to drive up north, but still want to visit, there are a number of alternatives to driving if you wanted to just drive the southern section and then find another way up north to avoid the stress of driving. For example, there are daily flights from Reykjavik up to northern Iceland (to Akureyri International Airport) as well as daily public buses. Another alternative to driving the Ring Road in winter is to just take a guided tour of the Ring Road. Then it is up to the company to sort out any issues if there are winter closures or detours. But it does mean a lot less flexibility. If you do decide to drive the full Ring Road, we’d recommend being flexible about your time up north. So far this winter, sections of the Ring Road have been closed a number of times, and the east and north parts are normally the most affected. I would keep a close eye on the weather and road conditions before and during your trip, and perhaps have flexible hotel bookings if possible in case you need to change your plans due to weather. Hope this helps, and feel free to follow-up if you have further questions. Wishing you a great trip to Iceland in March. We are planning a trip in the middle of September of 2018. I’m trying to plan this myself, but I keep going in circles because there is so much to see! I get more excited to go when I see all the beautiful pictures. As of now I have us doing the Blue Lagoon the day we arrive on our way to Reyjavik and spending the night in Reyjavik and doing what we can the day we arrive. day 2 we will drive from Reyjavik to Kirkjubaejarklaustur and spending the night there. Along the way doing tectonic plate, Geysir, strokkur, Gulfoss waterfall, Skofass waterfall, basalt columns, Dyrholaey, systrafoss waterfall, kirkjugolf basalt colums, systravath. is this doable? I’m not sure how much time we will be spending at these areas . I’m having a hard time determining how far to travel each day and where to spend the night. We will have roughly 7 full days in Iceland. We want to do the Golden Circle and Ring Road. Any suggestions would be a hugh help. Thank you. Love your blog and pictures! Hi Christy, Yes, there can be a lot to see in Iceland and 7 days means you will definitely have to pick and choose where you want to stop and what you want to do around the Ring Road. This itinerary is geared towards winter (and is all seasonal) so emphasizes the most visited and popular parts of Iceland, around Reykjavik, the Golden Circle, and the South Coast. But since you are visiting in September it is much easier to drive the full Ring Road and you’ll have more daylight, but you won’t get to see as much compared as if you focused on a couple of areas. In regards to your plan for Day 1 and 2, I think you can do all that on Day 2 but it will definitely be a busy day. You probably won’t get to see much of Reykjavik on Day 1 since you’ll be just coming in from the airport and heading to the Blue Lagoon and you’ll likely be tired by the time you get to the city. So you may want to leave time on Day 7 to see anything you miss if there is much you want to do in the city. We don’t yet have a Ring Road itinerary up yet (coming this summer so I am happy to send it to you then since your trip is not until Sept.) but here are some tips to plan your itinerary since it sounds like you already have a list of places you want to visit. First, figure out how much daylight you have each day and plan according to that as you are not really going to be able to sightsee before sunrise or after sunset. So in mid September sunset in Iceland is between about 7:00pm (19:00) and 7:30pm (1930) depending on the day and location. Then I’d use Google maps to put in the stops you want to make to find out the approximate driving time to get from place to place. Add a bit of extra time to each (for unexpected stops, traffic, finding parking) and approximate how much time you want to spend at each stop (e.g., 2 hours at Thingvellir National Park and 30 minutes at Gulfoss). If you choose to go hiking or book any activities (e.g., going into an ice cave, whale watching or snowmobiling on a glacier) then you’ll need to be sure to allow plenty of time for those as well. You may want to purchase food at grocery stores and convenience stores ahead of time to have lunch on the road to save time eating and searching for lunch stops. However, if vacation planning is becoming a hassle, you might also just book a self-drive trip such as this one that takes in the entire Ring Road in 7 days. Your car hire, GPS, maps, a suggested itinerary, assistance in booking tours, hotel accommodations, and breakfasts are included. A good option if you want to save time and of course you are flexible in where you stop each day! Hope this helps a bit and if you want to follow-up in July, we should have a full Ring Road itinerary ready by then as we are hoping to get back to Iceland again in June to do the full Ring Road drive. Hi! I really enjoyed reading your post and have learned a ton about travelling in Iceland. We are thinking of going March 2018 and really need to get a move on booking this. We are not sure if we will go for 5, 6 or 7 nights yet. We will probably plan a lot of our itinerary based off of yours. Some musts would be Reykjavik, Golden Circle, and the Southern Coast (hopefully up to Jokulsarlon). Is this doable if we only do 5 nights? Do you recommend substituting something else instead? We are late 40s/early 50s and are active and love travel and adventure. We are not big on tours and so I am not sure if we will book any. Not opposed to them and would consider some if highly recommended. We like to make our own adventures. I think we are mainly going to appreciate the scenery. Maybe some hiking, hot spring bathing. We want to enjoy the country and not overbook and run from one place to another. We will rent a car. We are comfortable with driving in winter conditions as we are coming from Canada and are just at the end of a wicked cold snap (been about -30 degrees Celsius for about 2 weeks). Can’t believe we are considering somewhere cold instead of hot!!! I am not sure how to start off our itinerary as the flights we are looking at land at 4:25 am. Where should we head on our first day and where should we start our itinerary? Any suggestions you can make would be greatly appreciated. Glad you found our Iceland itinerary helpful, and yes, I think that you could definitely visit Reykjavik, Golden Circle, and the Southern Coast (including Jokulsarlon) with 5 nights in Iceland. You can easily use our itinerary as a guide, just take out the 2 days on the peninsula and west coast. In terms of tours, I think it is nice to do at least one tour as they can really get you out there on a glacier, in an ice cave, snorkeling in rifts, snowmobiling, or on a boat to see Iceland from a different perspective. But it is up to you of course as tours are expensive (well, many things are expensive in Iceland). 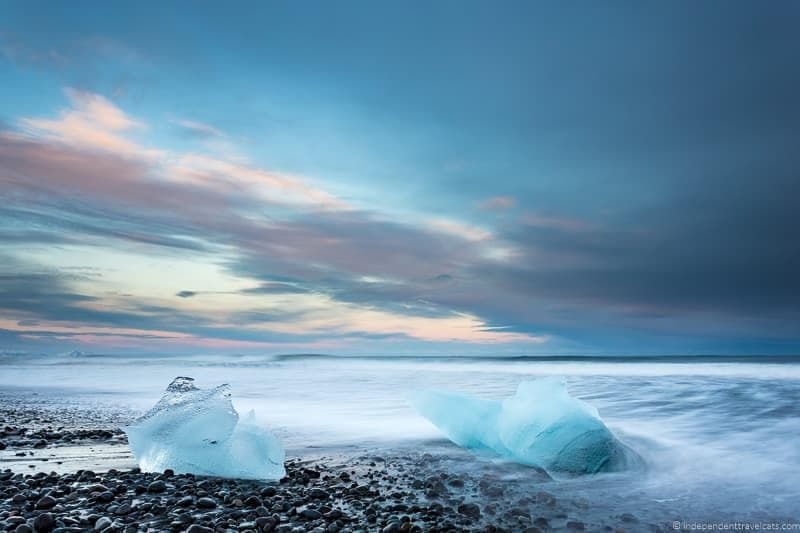 We recommend Iceland Travel as we have used them, enjoyed their tours, and respect their views on safety and responsible travel as one of the oldest travel companies in Iceland. We list some recommended tours within the post that would work with your itinerary such as horseback riding outside Reykjavik, snorkeling or snowmobiling (around Golden Circle area), or glacier walks, ice climbing, or an ice cave tour a bit further east on the following day. But there are loads of things you can do and you can see our post on Iceland winter activities to see if any of these interest you. Yes, coming from Canada, you should have no issues with driving in the winter and road rules are very similar to US/Canada. Depending on where you are from in Canada, Iceland may not seem very cold for you. The western/southern parts of Iceland benefit from the Gulf Stream, making for relatively mild winters along the coasts. Not much is going to be open that early in the morning (Blue Lagoon opens at 8am). So I would pick up your rental car (hopefully they can arrange for early pickup) and head to Reykjavik first (drop off your luggage at your hotel), pick up some coffee, and enjoy a morning walk around the harbor area as well as the church which is really nice for sunrise. Then you can visit some of the museums/attractions once things start to open up (most open around 10am in winter). Alternatively, I would do the itinerary in reverse and use the time to drive out towards the glacier lagoon and spend the night over in that area (maybe Vik), perhaps stopping at a couple of waterfalls on the way (you’ll be one of the first ones there), then you can work your way slowly backwards to Reykavik. I would spend a full day/night in order to explore Reykjavik and perhaps stop at the Blue Lagoon on your final day before the airport if you wish to go there. Hope this helps, and let me know if you have any further questions about Iceland! Wishing you a wonderful trip. Hey! Beautiful post with so much helpful information on traveling to Iceland! I’m thinking about going to Iceland in December next year, bit hesitant as I don’t want to snow to inhibit too much hiking and seeing the outdoors, but really want to try and catch the northern lights! Are all of your photos in this article taken in the winter time? They’re beautiful! Your Iceland itinerary looks absolutely fabulous and perfect! Everything I was looking for, my boyfriend and I are planning to go for an 7 day trip, so it fits us perfectly! I didn´t see if you mentioned it, but where and when in all the places and activities you mentioned on your itinerary would it be a good spot/time to see the aurora borealis? that´s the main reason we are doing this trip. Thanks so much! You really helped us so much! Now I can know how to plan our trip! First, thanks so much for taking the time to leave a comment, it means a lot to us to know that our travel advice and stories helps others with their own travels! It sounds like you have a fun Iceland trip planned and I am glad our 7 day Iceland itinerary is helping you plan your trip. Now, for the Northern Lights question. In terms of when, there is no particular time that is best, any time in the winter is a good time to see the Northern Lights. The best time of day is late at night/very early in the morning during the darkest hours. In terms of place, you want to ideally be in a place with no or little light pollution (rural area) and a place where there is clear or mostly clear skies (no clouds, no rain). Now, the biggest issue is that you need there to be solar activity & you can track this using the website we mention in the article. Also hotels will normally have the info available for guests. If there is a high chance of strong solar activity for that particular day in your area, I’d head out after dark to see if you can see them away from any city lights. Sometimes you can simply walk outside of your accommodation as it will often be dark enough or drive a short distance to where there are no lights. If the solar activity is strong and the skies are clear, you can see them almost anywhere in Iceland outside of Reykjavik (as it is the only city of any size in the country, so the place with most light pollution) but for a better chance head to an area with the least light pollution and where the forecast shows clear skies. You need both of these things. Some places on the itinerary that are good spots are the area around Húsafell, Snæfellsnes Peninsula, the area around Vík, and the area around Vatnajökull National Park are all great places to see the Northern Lights. Wherever you are staying can always help give you an idea of where you can go for a place to spot them and they can tell you if they are often visible from the hotel or if you should drive a bit away for a better chance. If you book a guided tour, most itineraries already include Northern Lights hunts in them. If you are driving yourself, you can also join an evening Northern Lights tour, these include a guide and driver who knows the best spots and these tours generally only leave if there is some chance to spot them. Some of these tours also include unique opportunities like snowmobiling on a glacier at night, taking a boat tour, or going to a hot spring at night to try to see them. These can normally be booked in advance or booked same day (if you already see forecast is positive). There are loads that leave from Reykjavik (such as this one and this one) but they can also be booked from spots along your road trip (such as this one that leaves from Hveragerði, near Selfoss). Just note that you do have a good chance to see them in the winter, but it is far from guaranteed. We actually were in Iceland for about 12 days last winter and didn’t see them. It was really cloudy most days we were there and/or there was low solar activity. They were visible the evening after we flew out though. So you just never know, so hopefully you’ll see them but plan your itinerary around all the fun things that you can definitely do during the day! We have an extra 2 days (unexpectedly), and we have already booked our hotels till day 5 of your itinerary, what would you recommend us to do on those extra 2 days? Taking into account the location in which we will be at that time? Also, we don´t plan to go to the “highlands” in Iceland, like where it could get really snowy and stuff, do you think it would be okay if we drive around the routes you stated with a normal car? or is it necessary for it to have 4 wheel drive? Again thanks a lot! I REALLY appreciate your work! It would be great if I could rate/recommend your blog somewhere. Hi Catalina, Well, it is nice to have a couple of extra days for your Iceland trip! I would probably do Day 6 of the Iceland itinerary as noted, staying in the same place as you did on Day 5 so you can stay at the same hotel for 2 nights. Then perhaps leave Day 7 to stay again in the same place as Days 5 or 6 or head back a bit and overnight in Selfoss to have more time to visit any places (park, snorkeling, waterfalls, tours) you may have not seen on the prior few days due to time or weather. Then on Day 8, you can drive along the fishing villages as outlined for Day 7 and perhaps visit the Blue Lagoon if you haven’t already and want to do so. Then I would spend Day 9 seeing more of Reykjavik (lots of cultural sites, stores, whale tours, food tour, and restaurants) or spend it soaking in a spa or public swimming pool. For the nights on Day 8 & 9, I’d book a hotel in Reykjavik (convenient for heading to the airport the next day). For the car, we do recommend a 4 wheel drive car in the winter. The highlands roads are inaccessible in winter (even to 4 wheel drives) but even the regular roads can get bad during and following a storm. Our week-long itinerary only takes in the main roads, none in the highlands, so all are normally accessible year round. If there isn’t any adverse weather the main roads are perfectly fine to drive with any car, but we know of several people who have had wrecks or traffic incidents in Iceland – whether this is due to the car, their lack of driving experience, or the weather is unknown 😉 If you do decide not to get a 4 wheel drive, just be more careful! Make sure you have good winter tires and check each day for road and weather alerts no matter what kind of car you rent. Thanks so much for your kind words, we are very happy to be of help! You can support us by following us any of our social media accounts and if you’d like to leave a short recommendation/review, feel free to email me (or just leave a Comment below) and I’d be very happy to include it on our Reader Comments at the bottom of this page. Wishing you a wonderful week in Iceland! Thanks a lot for this wonderful Iceland itinerary and the beautiful pictures! I’m planning to go on a road trip in january so will be useful! I was wondering: do we have to worry about parking places in the hotels we book or is there always place to park? Great and detailed blog. I’m currently in Iceland and did the 9 hour return trip to Jokulsarlon on my first day, stopping on the way at Vik, lava fields and several other scenic spots for pictures, it was by far the best scenic road trip of my life, and I’m travelling solo… the views to the volcanos, mountains, frozen Holtsos lagoon at sunrise, spectacular… not to mention Jokulsarlon, an incredible place… left Reykjavík at 9am and reached Glacier lagoon at 3.30pm, 2 hours longer than what google maps tells you… encountered snow blizzards, extreme winds which on a couple of occasions had me scared of flipping over, especially between Vik and Jokulsarlon by the lava fields, so be careful out there especially when overtaking. I was back to the capital by 8.30pm. Done gullfoss and geysir as part of the golden circle next day, couldn’t do Pingvellir yet due to closed roads. Breathtaking country though, since I like to do a lot in one day I’d say 4 days is enough for south east, golden circle and Reykjavík however it’s a lot of driving and requires a lot of planning… Oh and I’ve seen the northern lights on my second day, by the harbour just before I boarded the boat to the Northern Lights tour! 🙂 I rented a Hyundai I20 with studded winter tyres from Budget and it has given me confidence of driving through the main roads across the country without fear. And yes, it is a very expensive place by any standards. Thanks for all your tips! Wow! Without a doubt one of the best blog I have read about Iceland. Awesome pictures and detailed info too. Before, I knew about hot water pool only in Iceland. But this blog explores the other beautiful places too. Thanks for sharing! Thank you for this very informative blog! Going to Iceland this December and plan on driving as well..
Hi Sheena, You will have to skip a lot of great sites along the way, but yes it is possible; however, since you are doing it in December you’re very limited in terms of daylight. Just remember that although it only takes about 2.5 to 3 hours (in good weather conditions) to drive from Reykjavik to Vik along the main road, with all the stops above, you’ll have very limited time to really explore each stop given the short winter daylight hours. We’re on the fence between booking a tour to Jokulsarlon Glacier Lagoon (Ice Caves) from Reykjavik or driving their ourselves. We’re from California so we have little to no experience with driving on ice/snow. Is driving that far relatively safe with a 4WD? We plan on doing stops at Vik so we’re not driving the entire time! Hi Jason, So happy our Iceland itinerary has been helpful for your upcoming Iceland trip in December! You’re question is a tricky one. The weather is unpredictable, especially in December so you could arrive during a snowstorm or it could be just cold with no snow or ice at all on the roads. We were lucky as we only had one storm during our 2 weeks there, with a few hours of slow uncomfortable driving in drifting snow but otherwise the roads were pretty good. But we have driven in cold weather locations before. You can definitely safely drive in Iceland, even in winter, but if you don’t have any experience with driving in snow or with 4WDs, you might feel more comfortable booking a guided excursion or joining a tour. I would suggest doing whatever feels the most comfortable for you – if the thought of driving in a snow causes stress, I’d book a tour and leave the worries to the driver. Whichever way you go (tour or self-drive), Jokulsarlon Glacier Lagoon makes for a long day trip from Reykjavik even if you make a stop or two, and I’d recommend considering breaking it up into 2 days if you can. If you go the tour route, I’d consider a 2 (or 3) day tour (like this one) that also makes other stops like the Golden Circle, waterfalls, glacier walks, ice cave tours, and Vik in addition to the Glacier Lagoon. 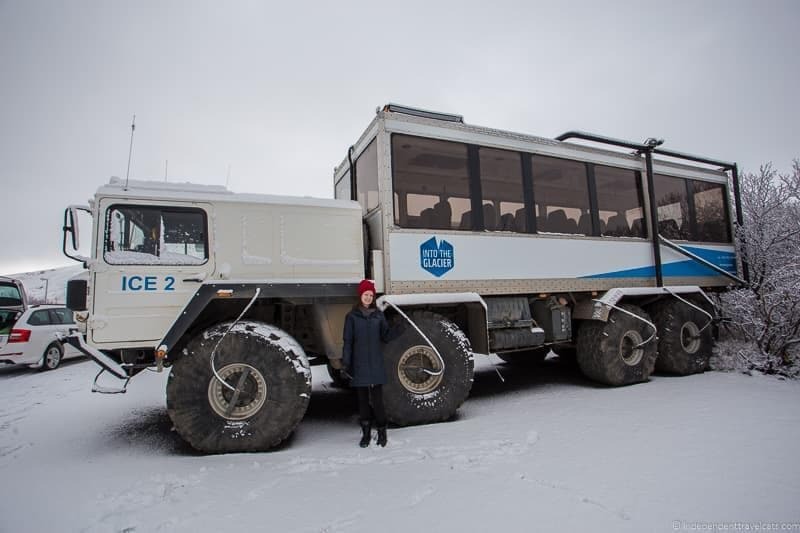 If you are wanting to visit the ice caves (these are different than the lagoon), you’ll need to join a guided tour that will likely start from Vik or around Jokulsarlon and will then take you in these Super Jeep vehicles up onto the actual glacier (never drive onto a glacier yourself of course!) and then you’ll do some hiking (companies can provide the crampons etc.) to reach the ice caves and explore inside them. These tours usually go to the “Crystal Cave” and take 3 to 4 hours – afterwards the evening may be a great time to stay out looking for the Northern Lights as there is almost no light pollution in this area of Iceland so you have a good chance to see them if there is activity and you have a clear evening (another reason to not visit this area on a day trip!). Hope this helps, and feel free to ask any other questions you may have as you plan your trip to Iceland! This is soooo helpful — and what beautiful photos! We are planning to go in February, and would like to self-drive and in the early planning stages. The ice caves are a must for us! Is the blue lagoon worth it? Hi there- wonderful pictures! Can you tell me the exact dates you were there? I’m thinking of a trip in winter also- but thinking November. Iceland is beautiful at every season, especially at winter! I would love to spend my winter holiday there! We’ve just come back from a 5 days trip to Iceland, and you’re correct, 7 days would certainly have been better. We felt a bit rushed and had some days with too much driving! 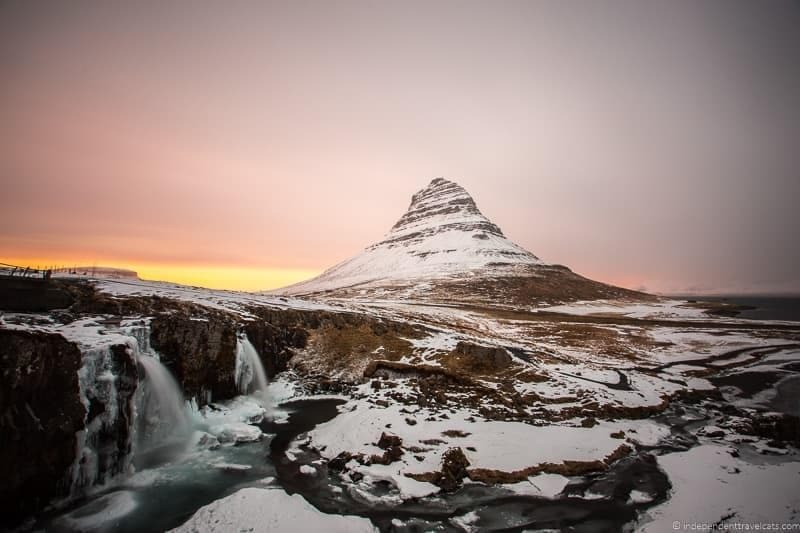 We had to sacrifice some sights as well – Gutted we didn’t make it to Kirkjufell, especially after seeing your photos! It’s an excuse to go back though! Thanks for this post, and great photos by the way! I am not big fan of visiting cold places, but this looks amazing. I think I am going to give it a try. this is great! so helpful… we are going to Iceland this summer and I just bought the lonely planet but was feeling a bit overwhelmed by it all… seems like there is so much to do. This post gives a great overview of what we can fit into each day. Thank you! We really want to see the Northern Lights but we are not good with winter weather! I hope we can brave it one day. Your pictures are stunning by the way! Especially the ones with the waterfall! I’m pinning this for future reference. Very comprehensive post about visiting Iceland in winter. I am assuming there is no other way to get to those beautiful sites but driving your own car, is it? I wouldn’t feel safe driving those roads in winter, although your beautiful pictures make me want to do that. We experienced icy roads both in Europe and the USA and they are not fun at all, but at least if you are in an area where there is more civilization you can hope for some help. We are planning to visit Iceland sometimes soon, but it will probably have to be in summer. We absolutely loved our self drive in Iceland. We took the ferry out of Denmark so we had our own car and had a wonderful 2 day ferry trip through the North sea. Thanks for the travel inspiration! Iceland is on my list but I’m not sure that winter would be my choice (although I would love to catch a glimpse of the Aurora Borealis). Your driving tips are thorough for winter conditions. The Iceland Travel itinerary looks pretty comprehensive so, while I usually do my own itinerary, I might use them and their expertise. Those vistas are just breathtaking, no wonder everyone seems to be raving about Iceland these days!! As usual, your photos are amazing and you included so much useful information. I really want to go to Iceland. I have debated about whether to do the winter or not. I do think I really want to drive and I am nervous about driving in the winter. I may have to do a roadtrip in the summer and then go back in the winter to just experience it. Thanks for sharing on #TheWeeklyPostcard. I have been dying to visit Iceland and keep saying on our next flight home to the US, we’ll go, but with every post I read about Iceland, I come to the conclusion it would be a waste to go for less than a week. There are so many beautiful places. We would want to do a self-drive road trip through the country, but I wonder if we would find everything. Saving this just in case for later!